It wasn’t that long ago, when it seemed that if you wanted a seriously good Canon camera for wildlife you where limited to perhaps the 1D series. That situation has changed for the good, in our opinion, and today there are four current “mid-range” camera bodies plus one recently discontinued, all of which we consider to be good enough for high-quality wildlife photography. All five are cheaper, lighter and smaller than the 1DX series. 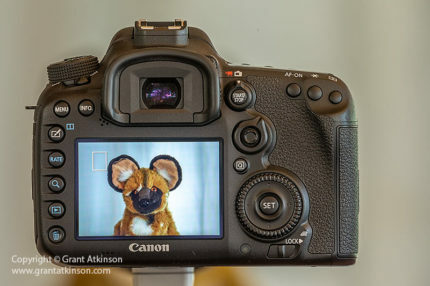 For this post, we have chosen to line up the 5D Mark 4, 6D Mark 2, 7D Mark 2, 80D and the discontinued 5D Mark 3 and describe how they work, for our kind of wildlife photography, with reference to one another. Another mid-range Canon body which offers class-leading resolution and lots more, is the 5D SR. The only reason that we did not include this camera in the comparison was that we did not have a 5D SR in our hands whilst we where putting the post together. 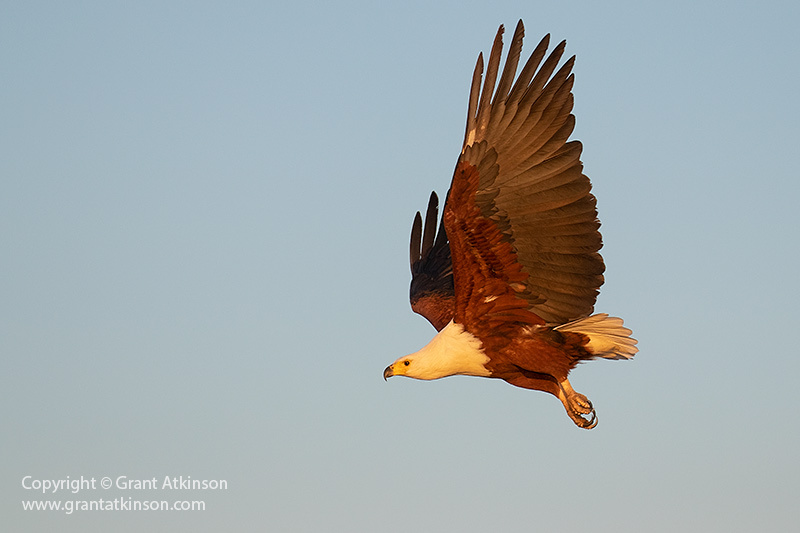 We have done a dedicated post on the EOS 5D SR and using it for wildlife photography, here. Another reason for writing this post, is to give wildlife photographers who like to work with two camera bodies, some idea of how one body works when shot side by side with another Canon body. These can be important considerations when choosing a second body. It is not our aim to directly compare these cameras with the aim of choosing one overall winner at the end. That approach doesn’t make much sense as these camera bodies differ quite radically in their market prices, with the 5D Mk4 costing between two and three times as much as the 80D. At the same time, amongst this group of cameras there are many similarities and feature overlap. 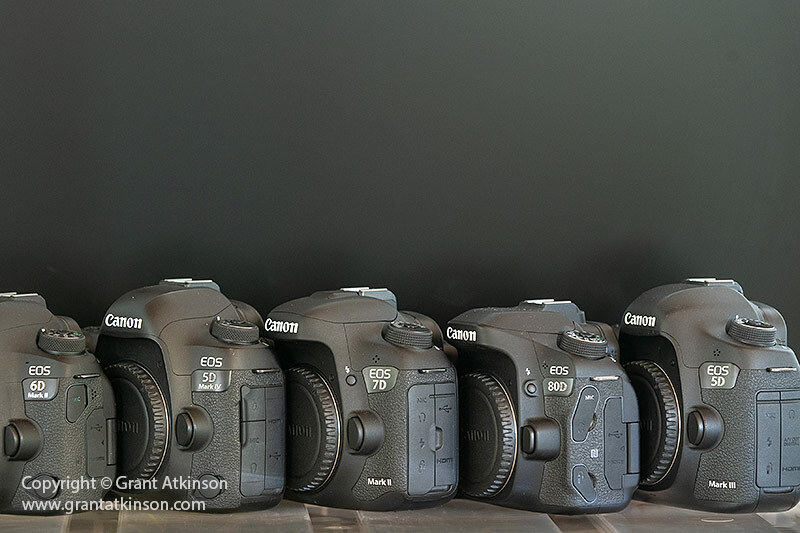 The newest camera in this group is the 6D Mark 2, followed by the 5D Mark 4, the 80D, the 7D Mark 2 and the discontinued 5D Mark 3. The key capabilities vary somewhat due to their specification as well as their age, and that can mean that sometimes it is not always the most expensive model or the newest that may excel in certain things. The best camera for you may be the one that excels in whatever aspect of the camera function and features are most important to you. We included the 5D Mark 3 even though it is discontinued, for a number of reasons. Many photographers have owned them, so it makes a good reference to the newer cameras. It can be bought on the used-camera market for much less than some of the other cameras in the group. The 5D Mark 4 ought to be the toughest of these cameras, along with the 7D Mark 2. These two cameras seemingly have the strongest chassis design (except for the plastic flash cover on top of the 7D Mark 2 viewfinder) and highest levels of weather-sealing. They are the only two bodies in this group with the sealing groove that circles the EF mount (and fits the rubber weather-sealing ring found on the mount of some EF-L lenses). The 5D Mark 3 is also built with a metal chassis, seemingly with fewer seals and gaskets than the newer 5D Mark 4 and the 7D Mark 2. The 6D Mark 2 and the 80D have chassis constructed of lighter, less costly materials. Whilst they don’t feel as robust in the hand as the bigger cameras in this group this could just be our perception due to their lighter weight. They also have less of the grippy rubber material than the three heavier cameras. We have no reason to believe that the 6D Mark 2 and 80D are not tough enough to to do the job. We expect that the swivel-tilt screens in the 6D Mark 2 and 80D and their hinge mechanism might not be as robust as the fixed screens on the other three cameras, but so far ours have held up perfectly. And there is an advantage to the flip screen in that it can turned around and folded inwards for total protection. All five bodies share basically the same mode dial and On/Off switch. We like the locking mode dial and have never damaged any of ours. To help with context, we use our Canon bodies outdoors, in direct sun, in hot and sometimes dusty conditions. Working with them inside game-drive vehicles also exposes them to bumps and knocks from the interior of the vehicles. They also get exposed to some of the unavoidable sand, dirt and debris that comes when we are shooting from the ground, especially low angle work. To try minimise wear and tear or damage, we keep our camera and lens combinations in 3mm neoprene soft bags anytime we are not shooting. To date, our record with the cameras in this group has been good, with just two broken rear LCD screens suffered so far (one on our 5D Mark 4, one on our 7D Mark 2). We use Kenko LCD screen protectors on all our cameras, and believe they go a long way in helping ward off scratches and scuffs and even more serious damage. Of course, we don’t always get them fitted in time, and have even used hand-cut cell phone protective plastic when we had no other option. Build quality also plays a role in how clean these cameras stay on the inside. When it comes to dust and debris, we find that the 7D Mark 2 image sensor stays the cleanest for the longest, amongst all our dslr bodies. 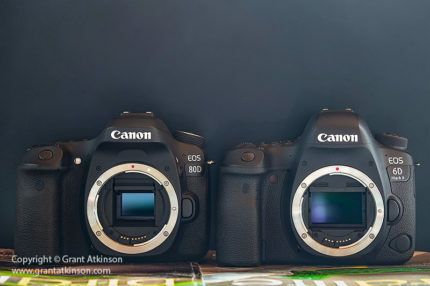 The 80D is next best at staying clean, followed by the 6D Mark 2, 5D Mark 3 and 5D Mark 4. None of them collect dust or debris on their sensors as often as some our 1DX bodies, or as often as some older Canon cameras that we used. Although we work in dusty environments we try to limit how often we change lenses in the field but sometimes it cannot be helped. It is also quick and easy on all five of these cameras to use a blower to dislodge any loose debris from the sensor. Of these five bodies, we also find that the 7D Mark 2 autofocus screen (it is located inside the body, above the mirror in a horizontal orientation on all the cameras) stays cleanest (dust on the autofocus screen appears in the viewfinder but not on the image). When it comes to controls, there are a lot of identical controls, but controls are also where some of these bodies differ the most. All five of these cameras have a version of Canon’s locking mode dial in the same location. 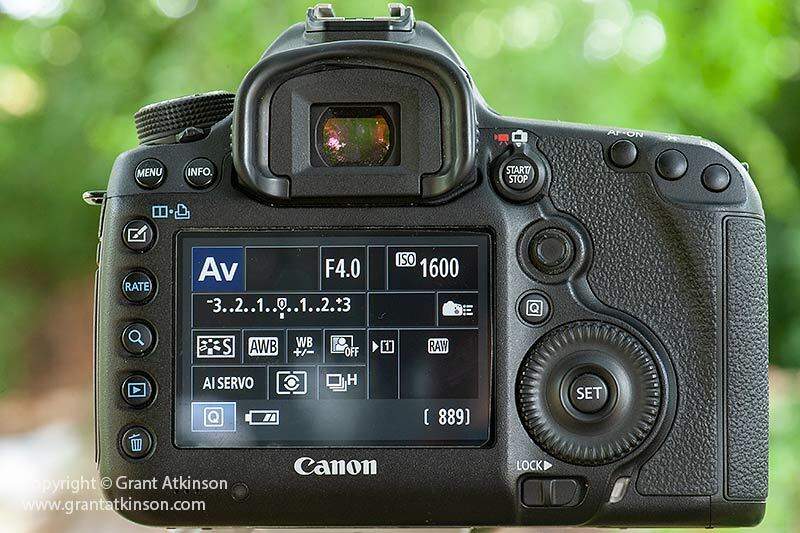 The 7D Mark 2, 5D Mark 4 and 5D Mark 3 all have similar mode dial options as well as 3 Custom mode settings, which are very useful for storing groups of often-used settings. The 80D and the 6D Mark 2 only have 2 Custom mode settings but they do each have a SCN mode option which is very helpful for those upgrading from compact cameras or the Rebel series. Canon 6D Mark 2 ‘help’ screen for each Mode and On/Off switch on top left. The On-Off switches are all identical in their location and function on the top left side of each camera. Canon 7D Mark 2 top view showing On/Off switch. All five bodies have a top display with key shooting information. 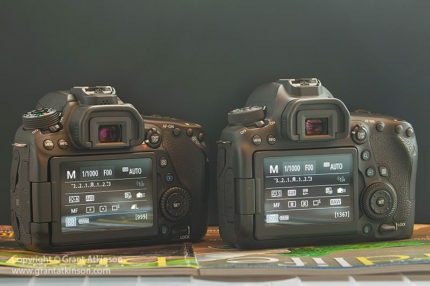 The 5D Mark 4, 5D Mark 3 and 7D Mark 2 have slightly bigger screens than the other two cameras. Ahead of the top screens, are a row of buttons, either 4 or 5 in number. On the 5D Mark 4, the 7D Mark 2 and the 5D Mark 3 (not shown above) these 4 buttons are identical in placement and function. Starting from the outside, there is the button for the light, then comes the ISO button. 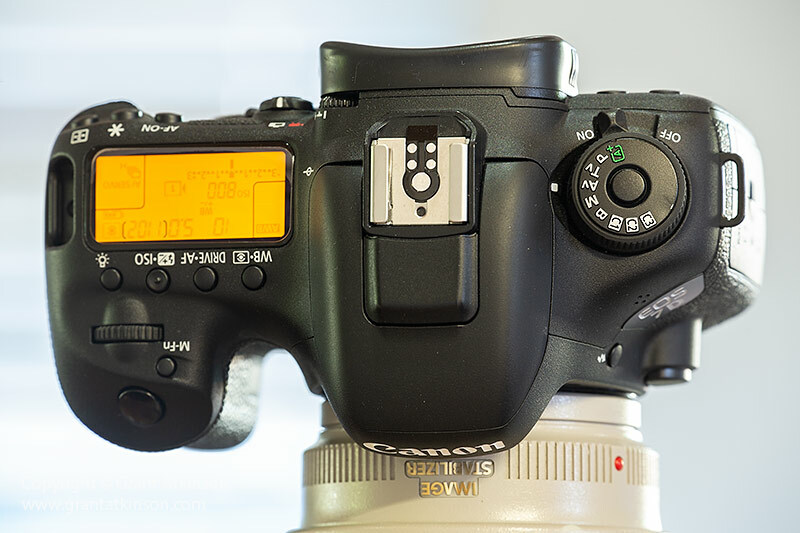 On the 80D and the 6D Mark 2 the Metering button is now in place of the ISO button. If we where still changing our iso manually, this difference would make it more difficult for us to switch between bodies with the ISO button second from right, and bodies with ISO button third from right. This is because when we are changing our iso setting manually, we typically do so without looking away from the viewfinder. We cannot see any advantage in having these controls in different locations. 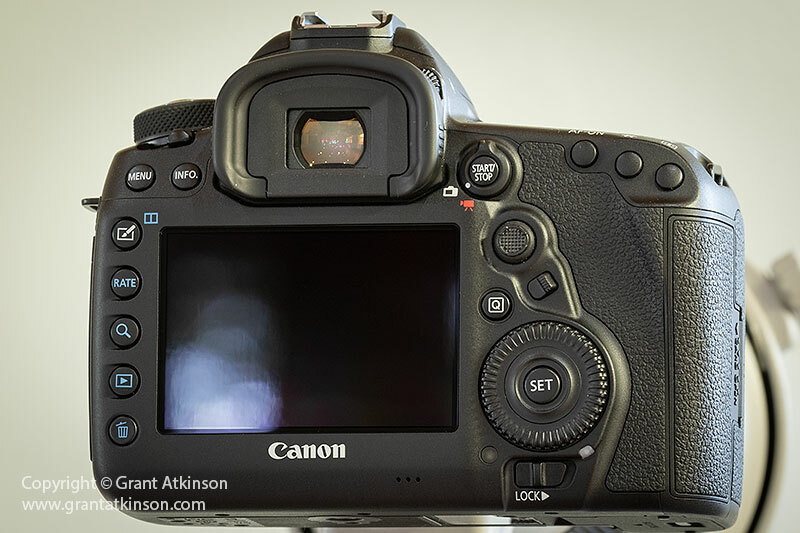 Canon 7D Mark 2 control button layout and top screen. Fortunately there are a few ways to work around this if you are using two bodies with different button layouts at the same time, and you cannot get used to it. It is possible to make use of the Custom Controls screen and reconfigure the Set button to the ISO function. (That can lead to further complications though if you use the Set button for exposure compensation). 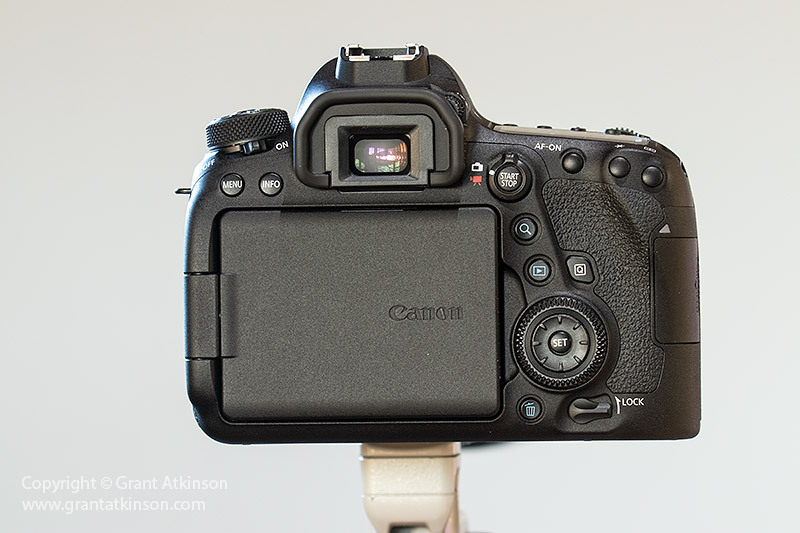 Canon 6D Mark 2 control button layout and top screen. Fortunately for us, we are able to avoid having to change the iso setting manually by shooting our cameras in M-(Manual) mode with Auto ISO switched on. Of course we set upper limits for the Auto- Iso for each camera. 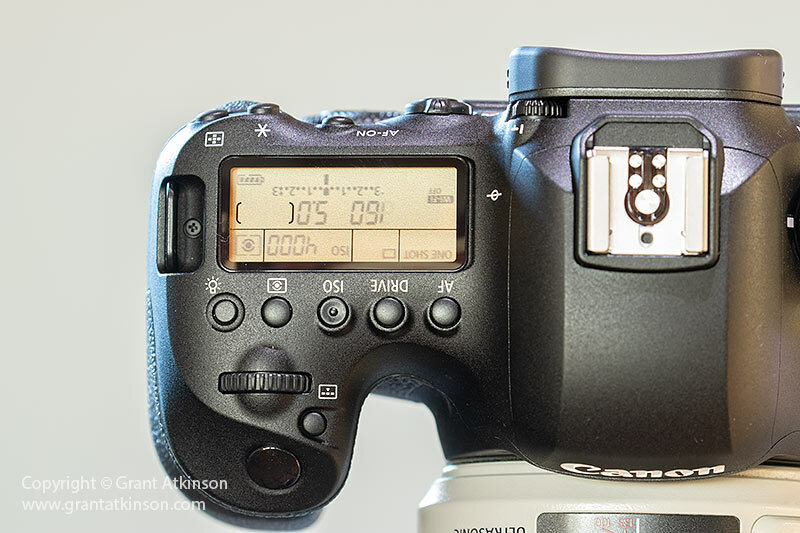 We configure all our Canon bodies then for aperture control on the front control dial (next to the shutter) and then the large rear command dial is used to set shutter speed. Then we just monitor the iso setting as it shows up in the viewfinder. We find this technique to be the most efficient and it works the same on all of the cameras, so there are no confusing differences to try remember when switching from one to another. Canon 5D Mark 3 top screen and control buttons, also M.Fn button for switching between focus modes. All five of these bodies have the small button (M.Fn) that sits beside the shutter release which we use for shifting between focus group options. It can be reconfigured to perform other functions on all the bodies if required. All five bodies also have the two buttons Menu and Info, located just to the left of the viewfinder. We just included images of two of the five bodies as the buttons are identical in placement and function on all of them. On the 5D Mark 4, 7D Mark 2 and 5D Mark 3, an identical row of five buttons run down the left side of the inch LCD screen, for Picture control/HDR access, Rate, Magnify, Playback and lastly Delete. 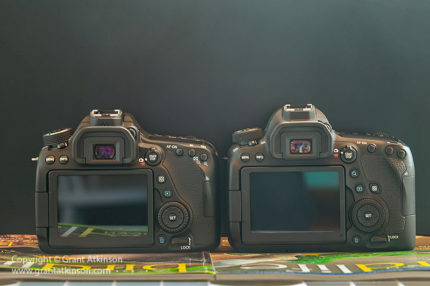 The 5D Mark 4 and 5D Mark 3 have rear LCD screens that are 81 mm wide (3.2 inch) whereas the 7D Mark 2 has a screen that is 77 mm wide (3.0 inch), which means smaller text in the menus. On the right side of the screen, from the top are a combination switch for engaging Live View and video, the dedicated AF multi-controller joystick, the Q-button for quick access to almost every setting, and then the large Quick Command Dial, with the Set button within. A sliding lock switch sits beneath. The 5D Mark 4 has a mini-switch that sits beneath the AF multi-controller and the 7D Mark 2 has a mini-lever that encircles the multi-controller that we use for changing AF groupings quickly without looking away from the viewfinder. The 6D Mark 2 and the 80D both have swivel-tilt screens which we much prefer. 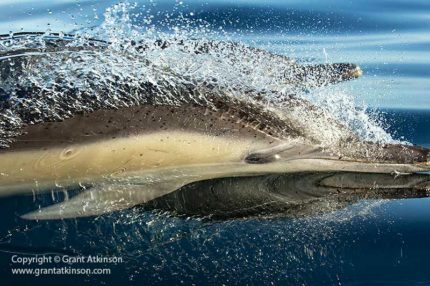 We can use these two bodies in Live View, with their fast and accurate DPAF focusing, and use the screen’s flexibility to allow us to get closer, lower, higher, with our cameras to our wild subjects without having to keep our eye to the viewfinder. The versatility of the swivel-tilt touch screen was one of the reasons that we bought our 80D and 6D Mark 2. The 5D Mark 4 also has an excellent touch screen with good resolution but it is fixed in place. The 7D Mark 2 screen and the 5D Mark 3 screens are perfectly adequate but seem outdated compared to the newer cameras in this regard. When shooting through the viewfinder, both Helena and I like to move our selected focus point around the frame for the purpose of composition, without looking away from the viewfinder. We find it easy to do this using the dedicated AF multi-controller found on the 5D Mark 4, 7D Mark 2 and 5D Mark 3. 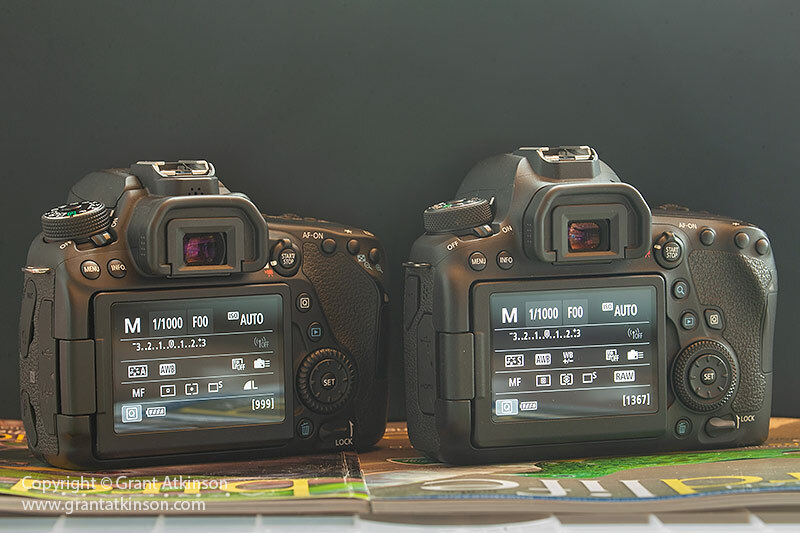 The 6D Mark 2 and 80D lack dedicated multi-controllers. 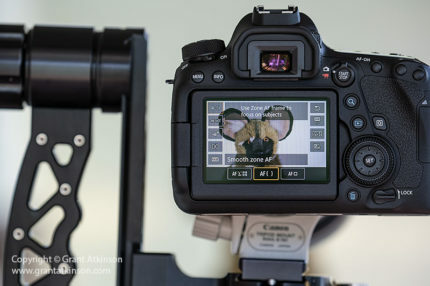 On the 6D Mark 2 and the 80D, it is possible to move the selected focus point by tilting the direction pad on the back of the camera, but we find this takes us a bit longer to achieve. Whether this impacts your shooting seriously will depend on your own usage scenario. If you are used to using a dedicated multi-controller to shift your focus point, not having it can be frustrating and lead to missed shots. If you don’t frequently move your focus point around in the frame you won’t miss the multi-controller very much. Of course there are other ways to move the selected focus point around like the dials but we don’t use that method ourselves. 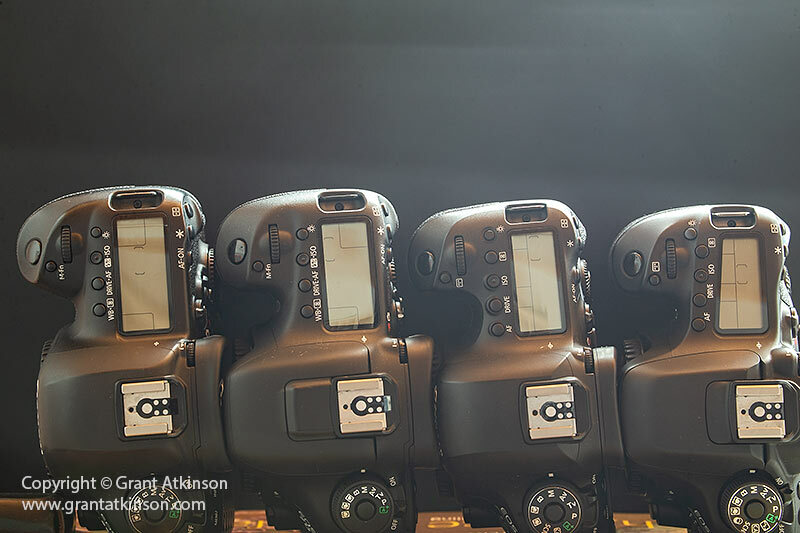 The 5D Mark 4, 5D Mark 3 and 7D Mark 2 have large, ridged rear command dials which we find easier to use than the smaller combination dials on the back of the 6D Mark 2 and 80D, usually to set shutter speed or compensation. The 5D Mark 4, 7D Mark 2 and 5D Mark 3 use the same eyepiece, and have similar viewfinders though the two full-frame models are more spacious to look through and may be brighter. The 6D Mark 2 and 80D share a smaller eyepiece than the other three cameras. Comparing the information on display within the viewfinders, it is only the much older 5D Mark 3 which lacks the electronic level, as well as the extra information like AF Mode, Drive, WB etc. It is also the only camera without flicker detection though we don’t use that much for wildlife. 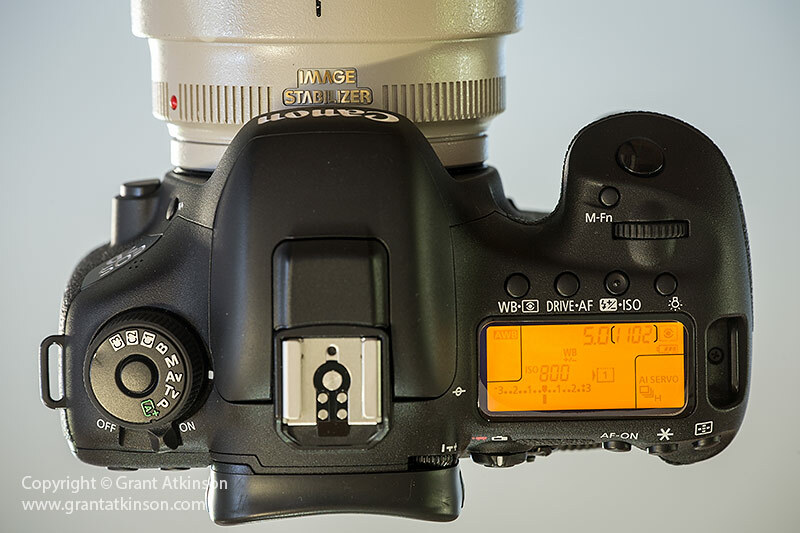 It is possible to customize the viewfinder quite easily on the 5D Mark 4, the 7D Mark 2, the 6D Mark 2 and the 80D. 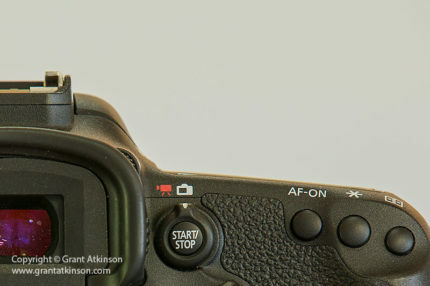 On the right side of the viewfinder, all five cameras have similar switches for activating Live View/Video capture, as well as a buttons for AF-On, and another for (*) Exposure lock. The button on the far right activates the focus group options on all the cameras. On the 80D it also functions as a zoom-in button but only in Playback mode. All five bodies have a Q-button on the back to give quick access to the main settings via the rear LCD. Only on the 5D Mark 4 you can customize what that screen looks like. It is also worth noting that the three cameras with touchscreens, whether swivel-tilt or not, being the 6D Mark 2, the 80D and the 5D Mark 4, allow many of their settings to be accessed directly from the rear touchscreen, which makes using them more intuitive. All five cameras also have the Custom Controls menu, where it is possible to reconfigure many of the buttons and dials to one’s preferences. In this regard, the the 5D Mark 4 has the greatest degree of flexibility when it comes to changing button and control functions, followed by the 7D Mark 2. The other three cameras offer options, just not as many. These five cameras can easily be split into two groups when it comes to ergonomics. In one group are the 5D Mark 4, 5D Mark 3 and 7D Mark 2, which are all quite similar to one another with larger dimensions, fixed LCD screens, bigger eye-pieces, deeper and taller grips (5D Mark 4 the deepest grip), large controls and dedicated AF multi-controllers. The 5D Mark 4 is the only one of the three with a touchscreen. 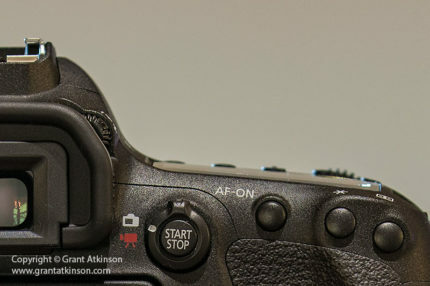 The 5D Mark 4 also has an AF selection mode lever (which can be reconfigured) that makes switching AF groupings (between Single Point and 6 other options) very easy. The 5D Mark 4 also has the most options when it comes to reconfiguring buttons and controls via the Custom Control screen. The 7D Mark 2 also has its own AF selection mode lever but it has a smaller rear LCD screen than the 5d series bodies and it has no touch screen. The 5D Mark 3 lacks the AF group selection lever of the other two bodies. All three of these cameras are extensively covered in grippy rubber, making them comfortable to hold. Their well-positioned controls make it easy to change settings without looking away from the viewfinder without making mistakes. All three of them actually look and feel so similar that I have already mistakenly packed one instead of the other in my camera bag for a trip away, when I wasn’t paying close attention. In the other group are the 6D Mark 2 and 80D, with their more compact form and extensive touch-screen capability that comes with the swivel rear LCD. The 6D Mark 2 and the 80D are quite similar to one another in size, though the grip of the 6D Mark 2 is the deeper and thicker of the two. Compared to some of the mirrorless camera bodies like the Canon M5, the grip and controls are larger and more comfortable to use, and provide direct access to settings. It may depend on the size of your hand whether you prefer the smaller sized cameras in this group (6D Mark 2 and 80D) or the larger cameras (5D Mark 4, 5D Mark 3 and 7D Mark 2). With both the 6D Mark 2 and the 80D, the multi-purpose circular pad on the back of the camera is used to move the active focus point around the frame. Whilst it does the job, I find it a bit fiddly and placed a bit low for my thumb. The touch screens found on the 6D Mark 2 and the 80D really make them both a lot more versatile for our kind of shooting. We like how we can use the rear LCD both for composition whilst Live View shooting, as well as the way we can change our perspective by working with the camera away from our face. 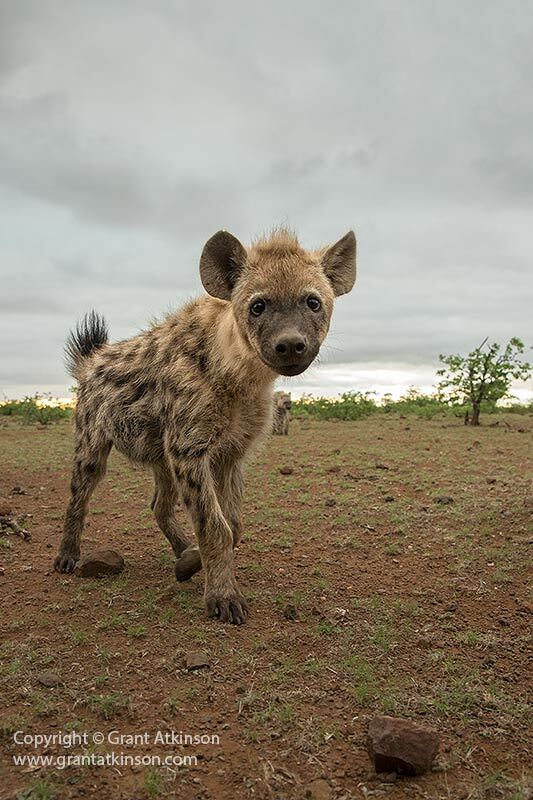 The spotted hyaena image above this text shows how effective the 6D Mark 2 can be when used this way. 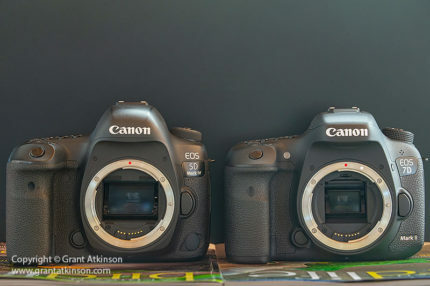 Comparing the cameras in size, we find the 5D Mark 4 and 5D Mark 3 to be the biggest, with the 7D Mark 2 very similar in layout but just a fraction smaller. 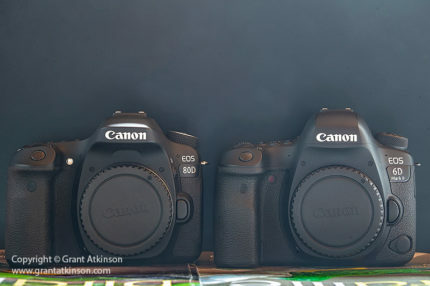 The 6D Mark 2 and 80D are significantly smaller again in dimensions and similar to one another in size, although the 80D has a smaller grip. All five of these bodies can be fitted with an optional battery grip, extending shooting time, and adding vertical controls, as well as creating a larger grip area. Your own perception of which of these bodies is big or small or just right will obviously depend on the size of your hands. It can also be influenced by the camera you used before coming to one of these bodies. Generally speaking, the 80D makes a good fit for users with small to medium-sized hands, whilst the 5D Mark 4 and 5D Mark 3 may be best suited to those with medium to large-sized hands. The 6D Mark 2 and 7D Mark 2 are in the middle. For shooting through the viewfinder we like the size of the 5D and 7D bodies with their deeper grips, and their dedicated AF multi-controllers. However, for Live View photography, which is making up an increasing percentage of our images, the 6D Mark 2 and the 80D stand out with the benefits brought about by their tilt and swivel rear screens. It is straightforward to compare the weights of these cameras. Lighter is better for us. The smaller size and composite construction of the 6D Mark 2 and 80D are the main reasons that they are significantly lighter than the other 3 cameras. 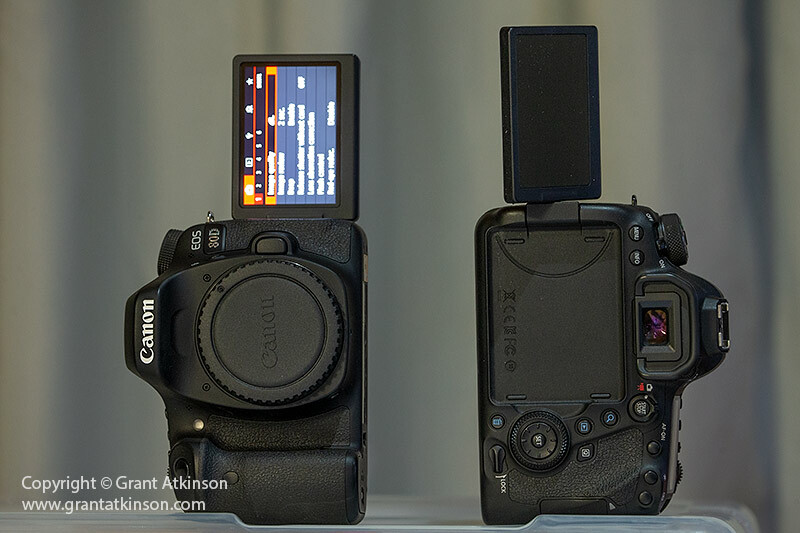 It is clear that Canon are actively reducing weight in their cameras. The loss of 40 g between the 5D Mark 4 and 5D Mark 3 provides an example, and this is despite the newer camera having a built-in GPS unit. All four of the newer bodies in this group use the same LP-E6N battery, which has increased capacity compared to the now discontinued LP-E6 battery (which comes standard in the discontinued 5D Mark 3. Some time back, we fitted our own 5D Mark 3 with the LP-E6N. Our typical usage pattern is 80-90 percent stills and about 10-20 percent Live View/Video. We use the cameras on a range of Canon L-series lenses, right up to 500mm focal length, and we keep image stabilization switched on all the time. Most of our shooting is done in Ai Servo focus mode. We shoot RAW only and switch off all unnecessary processing steps in our cameras. We spend only moderate amounts of time reviewing images taken, on the back LCD screen and don’t do any editing of images in the camera. The 6D Mark 2, 80D and 5D Mark 3 usually get somewhere between 1200-1500 shots on a charge. The 7D Mark 2 and the 5D Mark 4 typically deliver around 900-1100 shots on a charge. It is very convenient to have all five camera bodies sharing the same battery type, and charger, which makes packing for field trips simple, and also saves weight in our bags. Autofocus is one of the most important criteria for us when choosing our wildlife cameras. From specifications alone, it isn’t always easy to have an idea of which of these cameras has the best autofocus, or rather, which of them has autofocus good enough to do the job. Amongst this group, autofocus might be considered a differentiator. 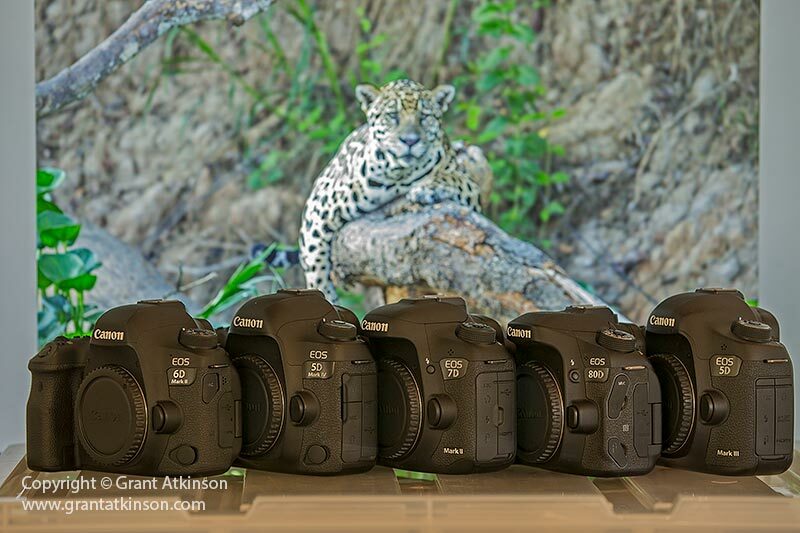 Amongst these five cameras, we find that the 5D Mark 4 has the best autofocus for our kind of wildlife photography. We shoot in Ai Servo virtually all the time, and like to use either the Single AF point, or one of the AF Expansion modes (One plus 4 helper points especially). We find that it is precise, accurate, and quick to lock onto a subject. It also has Canons newest 61-point AF grid, with the most extensive frame coverage (expanded vertically compared to the 5D Mark 3), amongst the other full-frame cameras in this group. We make use of the Single AF Point as well as Expand AF Area (One AF Pt Plus 4 Helper Points) most of the time. Sometimes we may use AF Zone on large subjects that are moving slowly but only when we have enough depth of field to cover for the reduced accuracy. We find the AF systems in the older 5D Mark 3, also a 61-point AF grid, to be very close in actual performance to the best camera in the group. 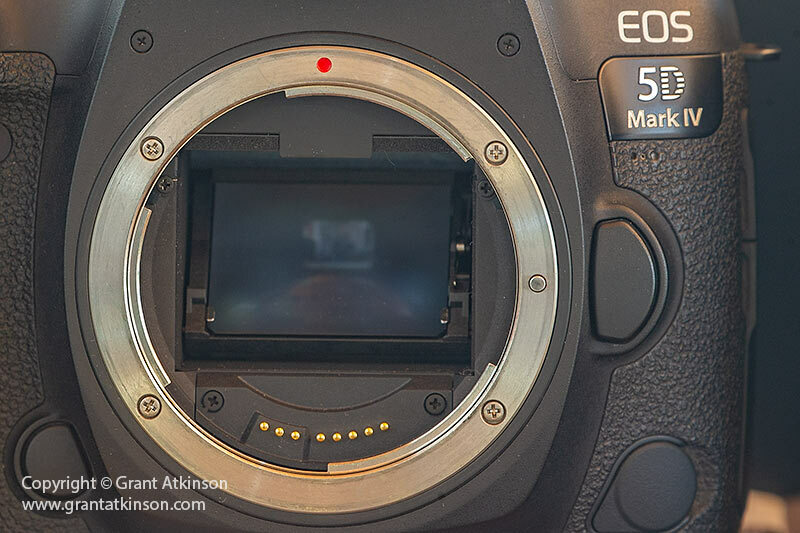 When EF extenders are used, the 5D Mark 3 autofocus slows noticeably. We make use of the Single AF Point as well as Expand AF Area (One AF Pt Plus 4 Helper Points) the most. Sometimes we may use AF Zone on large subjects that are moving slowly but only when we have enough depth of field to cover for the reduced accuracy. The 7D Mark 2 is equipped with a very good, 65-point AF grid, which is unique to that model but highly derivative of the AF systems in the 5D and 1D series. In our hands, it seems to deliver results almost as good as the 5D Mark 3 for us. We make use of Single AF Point as well as Expand AF Area (One AF Point plus 4 Helper points) the most. Sometimes we may use AF Zone on large subjects that are moving slowly but only when we have enough depth of field to cover the reduced accuracy. Something that we really like about the 7D Mark 2 autofocus setup is that on those occasions when we wish to reduce the number of AF points in our AF grid, going from 65 to 21 points still leaves all the outer AF points available for selection. In this we prefer it to the 5D Mark 4, where switching from 61 points to 41 points means we lose access to the outermost ring of points. Of course it is possible to work around this by focus and recompose, but we wish all the focus grid selection points worked like the 7D Mark 2 does. The 7D Mark 2 may even be slightly better than the 5D Mark 3 when using EF extenders. Because of its smaller image sensor, the focus points extend further toward the edges of the 7D Mark 2 frame. The 6D Mark 2 has a 45 point AF grid, with good density of AF points for placing a focus point where you need it. 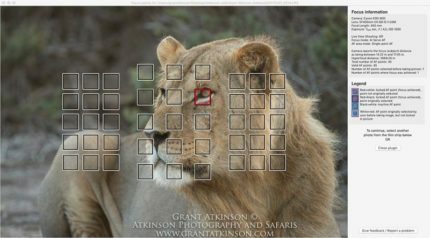 The spread of points does leave quite a large area of the image frame without coverage, so it can be good to become familiar with setting up a button on the camera to lock focus temporarily like the AF-ON button (in the Custom Controls screen) if you wish to remain in Ai Servo. It is also possible to switch to One Shot focus and then lock and recompose that way if you find that your composition requires you to. Users of the back-button focus method will be less affected by the narrower points spread. Focus accuracy of the 45 point grid is good. When it comes to the focus modes, we use our 6D Mark 2 almost exclusively in Single Point AF mode, and select the point manually. 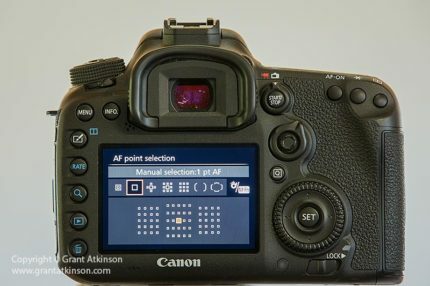 The 6D Mark 2 does not have the same range of expanded AF point options like Expand AF area found in the 7D Mark 2 and 5D series but it does have AF Zone. Sometimes we may use AF Zone on large subjects that are moving slowly but only when we have enough depth of field to cover for the reduced accuracy. The 80D has a 45 point AF grid, with good density of AF points for placing a focus point where you need it. The AF grid appears to be identical to the one found in the 6D Mark 2. Because of its smaller image sensor, the focus points extend further toward the edges of the 80D frame. It can still be good to become familiar with setting up a button on the camera to lock focus temporarily like the AF-ON button (in the Custom Controls screen) if you wish to remain in Ai Servo and recompose. It is also possible to switch to One Shot focus and then lock and recompose that way if you find that your composition requires you to. Users of the back-button focus method will be less affected by the narrower points spread. Focus accuracy of the 45 point grid is good. When it comes to the focus modes, we use our 80D almost exclusively in Single Point AF mode, and select the point manually. The 80D does not have the same range of expanded AF point options like Expand AF area found in the 7D Mark 2 and 5D series but it does have AF Zone. Sometimes we may use AF Zone on large subjects that are moving slowly but only when we have enough depth of field to cover for the reduced accuracy. Happily, Canon has implemented the main AI Servo autofocus tuning parameters in all five of these cameras. These are: Ai Servo First/Second Image Priority, as well as Tracking Sensitivity, Accelerate/Decelerate Tracking and AF Point Auto Switching options are all to be found in the menus of all five cameras. Even though the parameters are not all in the same place, they seem to work similarly and really allow the autofocus systems to be tailored to personal preferences or specific scenarios. 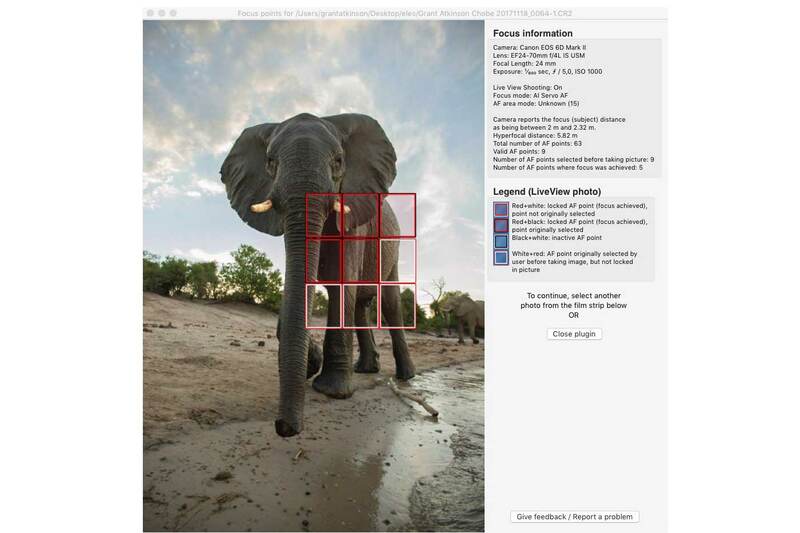 When it comes to Ai Servo function, we try to set up our cameras taking into account the following: Which lens: Subject speed: Subject angle: Background: Ambient light level: Ambient light direction. We have written extensive and detailed posts on setting up Canon autofocus systems before on this website here . In our use, the 5D Mark 4, 5D Mark 3 and 7D Mark 2 focus the fastest. Whilst the 6D Mark 2 and 80D are not slow to focus, they do take a fraction of a second longer to lock on in some circumstances. When we are placing our focus point on a subject which has a background of similar contrast and tone to the subject, it can make it difficult for the camera to acquire precise focus. In these conditions we find that the 5D Mark 4, 5D Mark 3 and the 7D Mark 2 make these difficult focus acquisitions with one positive drive, whereas the 6D Mark 2 and 80D may sometimes require a little more time. When it comes to focus point groupings, all five of these camera bodies have the highly effective Single Point AF, but only the 5D Mark 4, 7D Mark 2, 5D Mark 3 have the Expanded AF point options, which consists of a Single AF point surrounded by four helper points or eight helper points. We use the option with four helper points often called Expanded AF. The 5D Mark 4, 5D Mark 3 and 7D Mark 2 have fast and mostly accurate initial AF pickup and all three of them do a reasonable good job of returning us enough keepers from sequences of fast moving subjects. The 6D Mark 2 and the 80D can accurately focus on fast-moving subjects, just not as often as the other three cameras can. When ambient light levels are very low, like at the very end of the daylight and long after sunset, the 5D Mark 4 and the 5D Mark 3 keep on focusing positively. Next best is the 7D Mark 2, and then comes the 6D Mark 2 and 80D, slightly less accurate in Ai Servo and very low light situations. Our evaluation of viewfinder autofocus performance of these cameras is based purely on Ai Servo operation. We don’t use One Shot focus mode enough to know how we would compare them in One Shot focus performance. If you are mainly a One Shot focus user keep that in mind. Our shooting experience with these five camera bodies comes from using them with L-series lenses attached. All five cameras in this group work well when used with Canon’s EF 1.4x iii Extender and EF 2.0 iii Extender when combined with L-series lenses that can take extenders. We sometimes use extenders with our EF 70-200L f2.8 IS ii, but more often with our EF 400 f4 DO IS ii and EF 500L f4 IS ii lenses. On those three lenses, all of these bodies have all their focus points available and the maximum aperture becomes either f4.0 or f5.6. If the 1.4x EF Extender is used on the EF 100-400L f4.5-5.6 IS ii lens, the maximum aperture becomes f8. All five of the cameras in this group can still perform viewfinder autofocus with this combination. 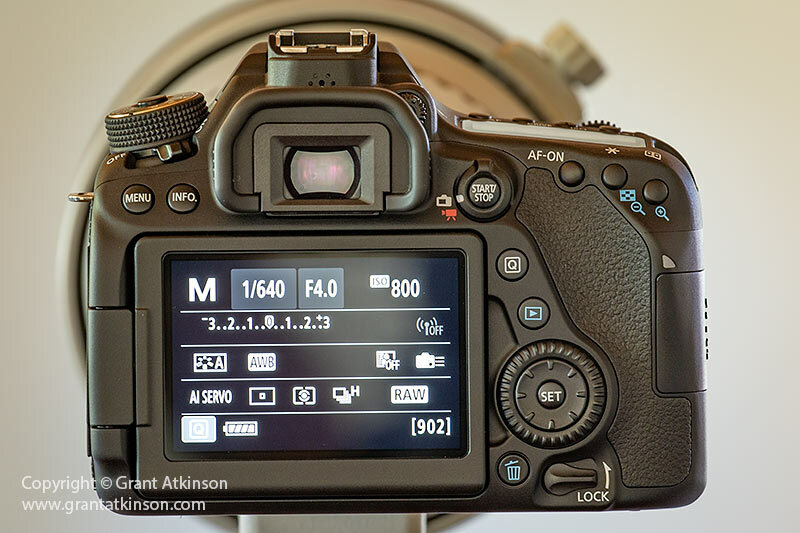 The 5D Mark 4 can still make use of all 61 of its autofocus points. We find that the 5D Mark and 7D Mark 2 drive the autofocus a little better with this lens and extender combination than the other three cameras in this group. The 6D Mark 2 and 80D function with a band of 27 autofocus points to choose from when attached to this lens and extender combination. The 7D Mark 2 and the 5D Mark 3 have their autofocus limited to a single (centre) point alone with this lens and extender combination. Canon 6D Mark 2 using DPAF in Live View. 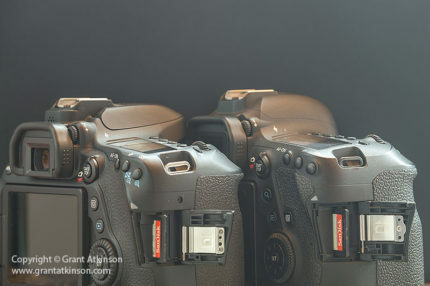 Four of the camera bodies in this group have Canon’s excellent DPAF sensors. Before DPAF (Dual Pixel Auto Focus), Canon Live View autofocus was steady, but very slow and suited only to tripod work for us. DPAF has completely changed that. We find that the four DPAF cameras, being the 6D Mark 2, the 5D Mark 4, the 80D and the 7D Mark 2 all enjoy very precise, and very accurate Live View focusing. Whenever we have scenarios suited to DPAF focusing on any of these 4 cameras, we prefer to use it over viewfinder focus. It works best when the camera is held steady and also any time the subject is still or moving slowly. In such circumstances it is very accurate, even more so than viewfinder focus. For this comparison, the 5D Mark 3 does do Live View autofocus but it is not DPAF equipped. It is therefore quite accurate, but very slow, and prone to ‘hunting’ back and forth when compared to the four newer DPAF cameras. It is the weakest of these five cameras in everything to do with Live View focusing by some margin. Using Live View DPAF allows a wide area for selecting the focus point. Looking carefully at the two images above of the 6D Mark 2 rear LCD will reveal the extent of the focus point coverage. Approximately 80 percent of the frame, both horizontally and vertically, is available for focusing. This is significantly more frame coverage in Live View than is available through the viewfinder focus point system even of the 5D Mark 4 and the 7D Mark 2. Amongst the four DPAF cameras, the approximate 80 percent horizontal and 80 percent vertical focus point coverage looks the same. When using DPAF, there is little difference in focus point coverage between the 6D Mark 2, the 5D Mark 4, the 80D and the 7D Mark 2, regardless of their different sensor sizes (35mm and 22mm). All four of the DPAF cameras have three different focus point group options. These options consist of a single point, a cluster of points which is moved by the user, and a tracking option where the camera decides what to focus on and uses groups of points. Amongst the four cameras, the focus point groups and methods have slightly different names. The options seem to function in similar ways despite having different names. On the 6D Mark 2 they are named: Live 1-point AF (single point), Smooth zone AF (the movable group) and Face (symbol) + Tracking (the face and subject tracking mode). On the 5D Mark 4 they are named: Flexizone single (single point), Flexizone Multi (the movable group) and Face (symbol) + Tracking (the face and subject tracking mode). On the 80D they are named: Flexizone single (single point), Flexizone Multi (the movable group) and Face (symbol) + Tracking (the face and subject tracking mode). On the 7D Mark 2 they are named: Flexizone single (single point), Flexizone Multi (the movable group) and Face (symbol) + Tracking (the face and subject tracking mode). The 6D Mark 2, like the other three cameras, has three different focusing options choose from. The single point option is on the far right. On the 6D Mark 2, the movable group of focus points is called Smooth Zone AF. In the menu listing this is the middle option. On the 6D Mark 2, the option with the symbol of a face (two dot eyes and a L-shape nose with smile line below) + Tracking is the AF method which is for recognizing and tracking a face in the frame. This is the same for all the cameras in this group. If it doesn’t find a face, it immediately switches to tracking whichever subject is of highest contrast or closest. Canon 6D Mark 2 using DPAF Face + Tracking method with focus point selected by touch. Most importantly, on the 6D Mark 2, the 80D and the 5D Mark 4, one can simply tap those cameras touch screens where we want it to focus, which then ‘tells’ the focus tracking to switch to whatever subject you select. It will then try to stay on that subject and follow it however it moves around in the frame. When using DPAF tracking on the 7D Mark 2, it is not possible without a touchscreen to set the starting focus point for the automatic tracking mode. We also use the single point option on all four of the cameras. The 6D Mark 2 and 5D Mark 4 have a smaller AF point, which makes for a more precise placement. The single point option, called Live-1 Point AF on the 6D Mark 2 and Flexizone Single on the other three cameras can be important when using DPAF in conjunction with telephoto lenses and the associated reduction in depth of field, making focus placement and accuracy crucial. When using DPAF on the 7D Mark 2 in Flexizone Single the focus point can be moved anywhere within the focusing area, including the corners. 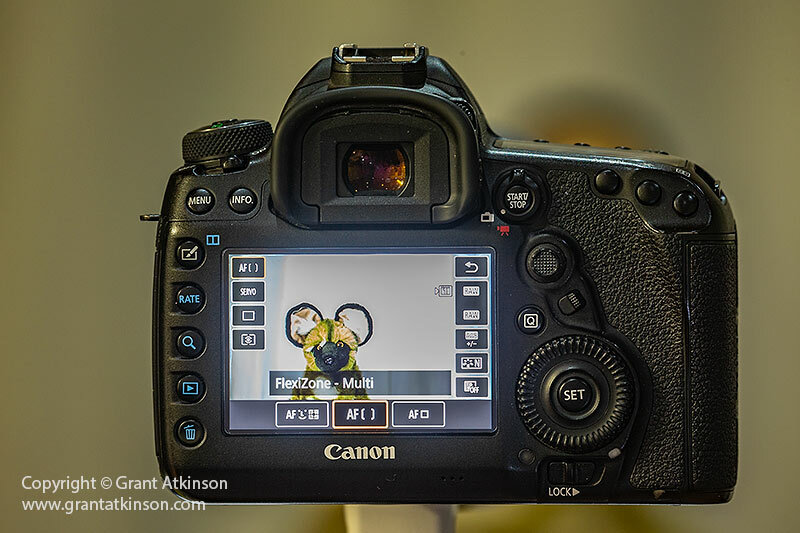 When using DPAF on the 7D Mark 2 in Flexizone Multi or Face + Tracking, the area outside the L-shaped brackets on the rear LCD is not available for focus. On the 6D Mark 2, the 80D and the 5D Mark 4, the area of the frame where focus can take place remains the same whether we are using the single autofocus point, or the group of movable points or the automatic (face) tracking option. The full 80 percent of the frame is used. On the 7D Mark 2, when using Flexizone single focusing, it too can focus over the full 80 percent DPAF area like the other two cameras. However, when the 7D Mark is used in Flexizone Multi or Face Tracking, it gives up some focus area in each corner of the frame. 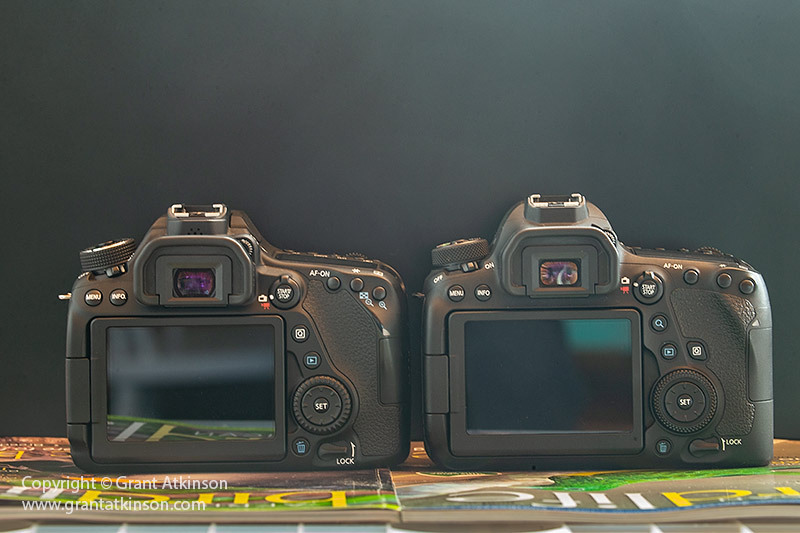 Of the four DPAF cameras in this group, the 6D Mark 2 is the newest, and the 7D Mark 2 is the oldest. It is clear to see this in that the 6D Mark 2 DPAF system is more sophisticated and can be configured in a greater variety of ways. Positives for DPAF focusing are its accuracy and precision. Ease of use is also a big advantage, specially when combined with the touch functionality of the Swivel-Tilt screen found in the 6D Mark 2 and 80D. When using Live View and DPAF for moving subjects, we find it easier to see to keep the focus point/s on the subject when using wide angle lenses. 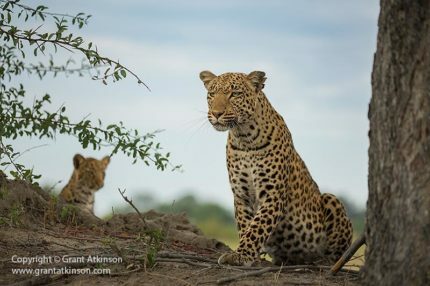 With telephoto lenses and their narrow field of view and Live View DPAF, we get our best results with subjects that are not moving too rapidly. 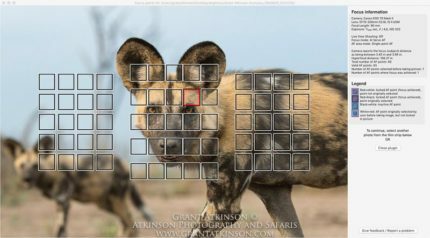 All four of the DPAF cameras when using in Live View make it possible to have a lot of shooting information on the screen, including a histogram to help with exposure (before the shot is even taken) and an electronic level. In Live View focusing the 6d2 and 80D are excellent, and their touch screen with swivel and tilt capability makes it possible to take images that are not possible with the other three cameras. We frequently get unusual perspective or very low angle images by making use of these two cameras Live View focusing with their screens turned toward us so we can shoot without having the camera close to our faces. Another benefit of the touch screen is the ability to use it to select a focus point and to trip the shutter just by touching it with a finger. On those occasions when we are very close to a wild animal, or trying to be as quiet as possible so as not to disturb a nervous wild animal, the touchscreen makes is possible for us to limit our own movement and noise and keep shooting rather than disturbing the subject. Video capture capabilities in these cameras could well be its own blog post. In order to not let this post become even longer, in summary, before DPAF, our video capture with our Canon dslr bodies was limited to just those subjects that where not moving much, or where moving in one restricted area. The introduction of DPAF has changed that and we are now able to record video much more easily than before. We are opportunistic video shooters, but having the capability built into our cameras has expanded what we are able to come with and raised the quality of our footage significantly. All five of these Canon bodies can record video, but only the 5D Mark 4, the 6D Mark 2, the 80D and the 7D Mark 2 have DPAF focusing. The 5D Mark 3 has very slow focus that hunts a lot. All the advantages explained in this post that DPAF brings to still shooting, plus more (like being able to do controlled focus pulls) and AI Servo control in video mean that we much prefer using the newer bodies that are DPAF equipped. The 5D Mark 4 and 6D Mark 2 have full-frame video capability at Full HD, (1920 x 1080 resolution), which we use the most. There is also a 4K high-resolution option available on the 5D Mark 4 but it comes with a 1.7x crop feature. The 80D and 7D Mark 2 also record good quality Full HD video, with their smaller sensors giving a tighter field of view. The swivel-tilt screens of the 6D Mark 2 and 80D mean that those two cameras are more versatile in how they can be deployed to capture video. For our kind of video capture, we consider the 6D Mark 2 and the 5D Mark 4 to be the best options, followed by the 80D, then the 7D Mark 2 and lastly the 5D Mark 3. Although video capture is of secondary importance to Helena and I when in the field, we have still managed to record some footage in Full HD on our Canon dslr bodies that we where able to sell for commercial use, just because it is so easy to do so when working with the DPAF cameras. We define response by how quickly the camera focuses and trips the shutter then moves on to the next frame. The 7D Mark 2 is the most responsive of these cameras by some margin when it comes to shutter lag and viewfinder blackout. It is followed by the 5D Mark 4, and then the other three cameras all quite similar in their responsiveness with the 5D Mark 3 slightly ahead of the 6D Mark 2 and 80D. The 7D Mark 2 is easily the fastest camera in this group, at 10 frames per second and it is the only one in the group that actually feels fast to us. Next comes the 5D Mark 4 at 7 fps which feels almost fast. Then comes the 80D also at 7 fps. The 6Dmk2 shoots at 6.3 fps and the 5Dmk3 at 6 fps. There is not much difference to be felt in speed between the three slower cameras and the 7D Mark 2 stands out in this category. It may be worth noting that the fastest shutter speed for 6D Mark 2 is 1/4000sec. The other four cameras can all shoot at 1/8000sec. The 5D Mark 4 and 7D Mark 2 have the same twin card configuration, with a CF drive and an SD drive next to each other. If one is using the appropriate fast cards, the CF drive allows the camera to shoot for longer and clears a little faster. The 6D Mark 2 and 80D both have just a single SD card drive, which is of the same speed rating as the SD drive in the 5D Mark 4 and 7D Mark 2. The 5D Mark 3 has one CF card drive, identical to the one in the newer 5D Mark 4, but the SD drive in the 5D Mark3 is very slow and will impede continuous shooting, even with a fast SD card in it. If you need the security of two-card shooting, then the 5D Mark 4, 7D Mark 2 and 5D Mark 3 are the best choices. For our wildlife photography, we usually just shoot to one card slot at a time, so it doesn’t matter if the camera has one card slot or not. We use Sandisk Extreme cards, SD or CF and have yet to have a failure. All five of these cameras have fairly quiet shutter actuations. In terms of their relative ‘loudness’ when shooting, the 7D Mark 2 is perhaps the quietest of all. Next is the 80D, then the 6D Mark 2, the 5D Mark 3 and the 5D Mark 4. The shutter sounds of the 5 and 7-series cameras are shorter in duration, whereas the shutter sounds of the 80D and 6D Mark 2 last a little longer. All five of the cameras have the option of a quiet mode in their Drive mode options. In quiet mode, the 7D Mark 2 is the quietest, then the 80D, then the 6D Mark 2, 5D Mark 3 and 5D Mark 4, with all three of the full-frame bodies sounding the same. Quiet is good for wildlife and for people, and all of these bodies are a lot quieter than our older Canon cameras as well as our 1DX series bodies. In this group of five camera bodies, three have full frame sensors which are approximately 35mm wide and 24mm high. They are the 5D Mark 4, the 6D Mark 2 and the 5D Mark 3. The other two cameras have much smaller sensors, which are approximately 22mm wide and 15mm high. This sensor size is called APS-C. 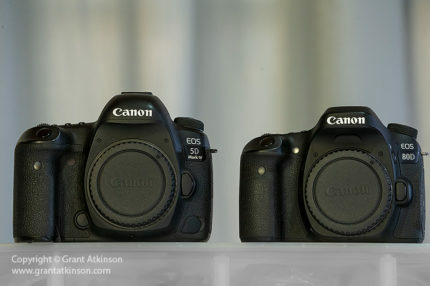 In this image it can be seen how much larger the 35mm sensor is in the 6D Mark 2 compared to the 22mm sensor in the 80D. Where the sensor technology is similar in its efficiency, then having a larger sensor area can deliver better image quality. Sensor technology generally improves with newer models. In this group, the newest camera is the 6D Mark 2, then the 5D Mark 4, then the 80D, then the 7D Mark 2 and then the 5D Mark 3 which is discontinued at the time of writing. 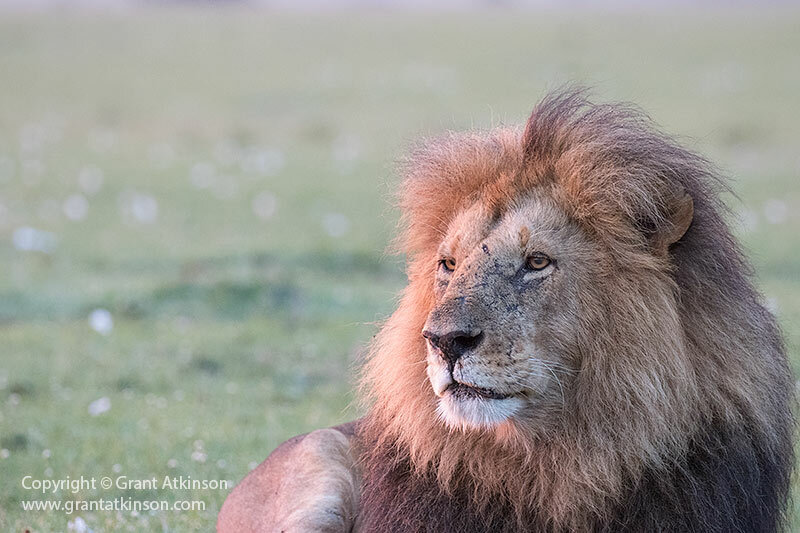 Whilst image quality, which is intrinsically linked to the sensor’s performance, is subjective, we believe that for our wildlife shooting requirements, full-frame sensors are an advantage. At the same time, as sensor performance is improving with each new model or generation, we are finding that those cameras with smaller sensors (APS-C) like the 7D Mark 2 and 80D can now meet our requirements for our wildlife work, just not in so many scenarios (most especially low ambient light) as the cameras with bigger sensors can. It is also worth noting that the image quality advantage that the newer 35mm sensor cameras (5D Mark 4 and 6D Mark 2) may not hold, if their images are cropped more than 50 percent. Its important to note that if you take the majority of your images at iso 100 or iso 200, then your image quality rankings of these cameras might differ from ours. We shoot in natural light, and often in light that may be less than ideal. We also handhold telephoto lenses and shoot high shutter speeds to counter camera shake. We photograph moving subjects and need fast shutter speeds to freeze their motion. Many of our wild subjects are also most active around sunrise and sunset. All of this means that we shoot at quite high iso settings, and we place value on good image quality at higher iso settings. Our most used ISO settings are from 640 to 3200 (obviously we will go higher when we need to) . All our Canon cameras are set to shoot in RAW, and we process our images using Adobe Camera Raw and Photoshop and Lightroom CC. To reduce noise we use the noise reduction tools in these editing programs only. In terms of colour and contrast, we find all of these cameras output very similar, up to iso 400. Above iso 800, the 5D Mark 4 is just a little better, with the 6D Mark 2 very close, and then the 5D Mark 3, the 80D and the 7D Mark 2. Colour and contrast become impacted the least on the 5D Mark 4 and 6D Mark 2 at iso settings of 3200 and above, whereas the other three cameras images degrade more noticeably. This difference widens at iso settings above iso 3200. When it comes to editing the raw files for these images, we find that the 5D Mark 4 allows for the most lightening (shadow recovery) of dark parts of an image. The 6D Mark 2 is next best in this regard, then the other three cameras which are not quite as good at this. Shadow recovery becomes less as iso settings go higher. We use 5D Mark 4 files up to iso 6400 for print, and up to iso 12800 for the internet. We use 6D Mark 2 files up to iso 5000 for print, and up to iso 12800 for the internet. We use 5D Mark 3 files up to iso 3200 for print, and up to iso 6400 for the internet. We use 80D files up to iso 2000 for print, and up to iso 5000 for the internet. We use 7D Mark 2 files up to iso 1600 for print and up to iso 3200 for the internet. African leopard, Botswana. Canon 6D Mark 2 and EF 400 DO f4 IS ii. Shutter speed 1/80sec at f4.0, iso 4000. Your own evaluation of image quality may differ but the numbers detailed above are a general guideline. People interpret image quality and noise in images according to their own preferences. It is also not straightforward to compare image quality of cameras with different sensor sizes and pixel pitches. There already exists much confusion and differing opinions online on how to compare image quality in digital cameras with different sensor sizes (35mm and 22mm in this group), different resolutions (between 30 megapixels and 20 megapixels in this group), and different individual pixel sizes. 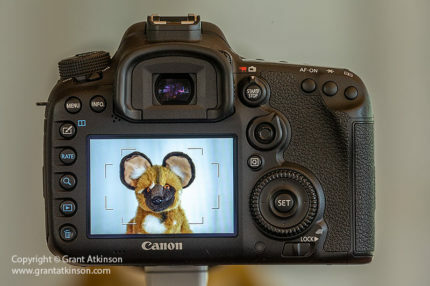 When it comes to photographing really high-speed subject matter, like big cats leaping, or wild dogs running, or fast-flying birds, we believe that we get a slightly higher keeper rate of really sharp images from our Canon cameras that have larger pixels than those with smaller pixels. How much of a difference in keeper rate is hard to measure as there are very many variables. 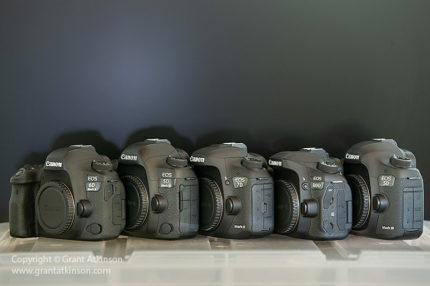 In this group of five cameras, the 5D Mark 3 has the largest individual pixels, followed by the 6D Mark 2, the 5D Mark 4, the 7D Mark 2 and the 80D. We try to make an effort to be extra steady in our stance or grip when using the cameras with smaller pixels. We generally shoot faster shutter speeds than 1/1000sec if something is moving fast anyway. Cameras with sensors that have small pixels bring an advantage on those occasions when the subject is far away and the image has to be cropped. In such instances the 80D is best, followed by the 7D Mark 2, then the 5D Mark 4, 6D Mark 2 and 5D Mark 3. The 5D Mark 4 has the highest resolution at 30 megapixels. An un-cropped 5D Mark 4 image is 6720 pixels on the horizontal (long) side and 4480 pixels high (high) side. A vertical crop at a regular 3:2 aspect ratio of a horizontal frame from this camera gives an A4 sized image (such as might be used for a magazine) of 13.4 megapixels. 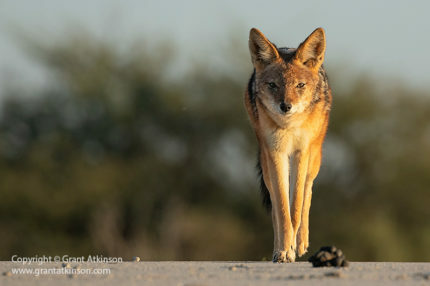 Black-backed jackal, Botswana. Canon 6D Mark 2 and EF 100-400L f4.5-5.6 IS ii. Shutter speed 1/1000sec at f6.3, iso 400. The 6D Mark 2 has the next highest resolution at 26 megapixels. An un-cropped 6D Mark 2 image is 6240 pixels on the horizontal (long) side and 4160 pixels vertical (high) side. A vertical crop at a regular 3:2 aspect ratio of a horizontal frame from this camera gives an A4 sized image (such as might be used for a magazine) of 11.5 megapixels. The 80D has the next highest resolution at 24 megapixels. An un-cropped 80D image is 6000 pixels on the horizontal (long) side and 4000 pixels vertical (high) side. A vertical crop at a regular 3:2 aspect ratio of a horizontal frame from this camera gives an A4 sized image (such as might be used for a magazine) of 10.7 megapixels. The 5D Mark 3 has the next highest resolution at 22 megapixels. An un-cropped 5D Mark 3 image is 5760 pixels on the horizontal (long) side and 3840 pixels vertical (high) side. A vertical crop at a regular 3:2 aspect ratio of a horizontal frame from this camera gives an A4 sized image (such as might be used for a magazine) of 9.8 megapixels. 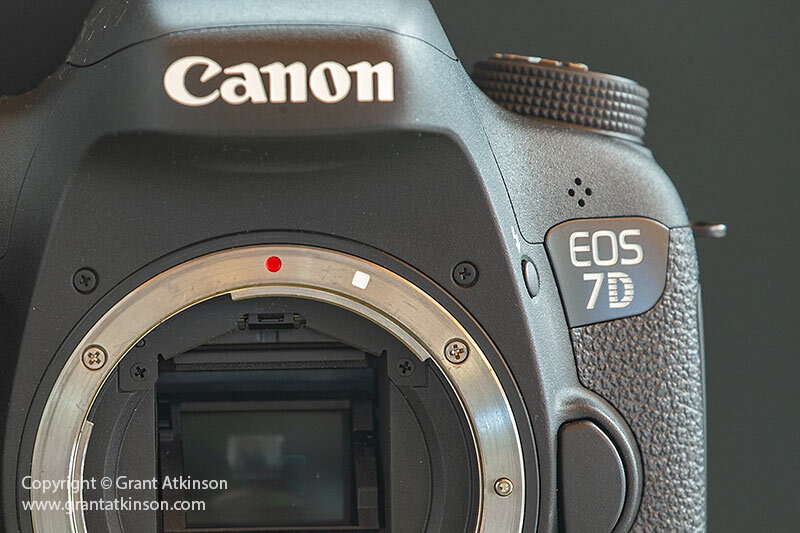 The 7D Mark 2 has the next highest resolution at 20 megapixels. 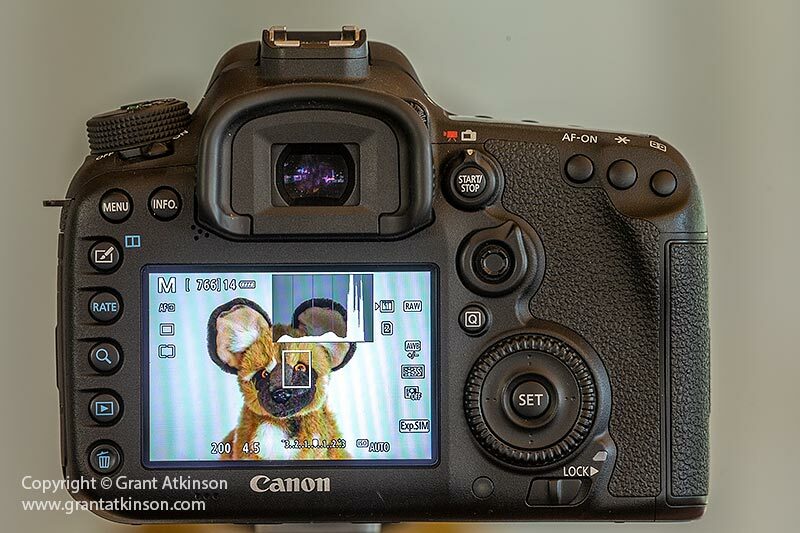 An un-cropped 7D Mark 2 image is 5472 pixels on the horizontal (long) side and 3648 pixels vertical (high) side. A vertical crop at a regular 3:2 aspect ratio of a horizontal frame from this camera gives an A4 sized image (such as might be used for a magazine) of 8.9 megapixels. Of these five cameras, we have used used the 5D Mark 3 bodies the most, followed by the 7D Mark 2 and 5D Mark 4. We have not anywhere near the same number of frames through the 6D Mark 2 and 80D bodies. Our 5D Mark 3 and 5D Mark 4 bodies have been excellent when it comes to reliability. We have never experienced even a single failure of any kind with them. We have seen a few AF multi-controllers collapse, on the back of 5D Mark 3 bodies, but never on any of the three 5D Mark 3 bodies that we owned and used heavily for a few years. 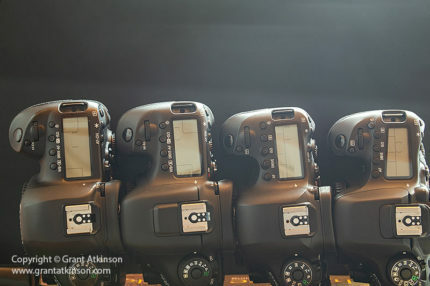 Our 7D Mark 2 bodies have on very rare occasions, shown some sort of glitch when the camera failed to properly switch on. All that was needed to solve the problem was to switch off the camera, remove and re-insert the battery and the media cards, remove and refit the lens, and everything was perfect again. It has happened perhaps twice in a year with our 7D Mark 2 bodies and only to one of them. The 6D Mark 2 and 80D have not skipped a beat, and not shown any glitches or niggles so far, although we don’t set out to use them as heavily as we use the other cameras. Flicker mode which times exposure to sync with certain types of artificial light, and can be a powerful, time-saving, image-quality feature if you shoot under artificial lights, is only available in the 5D Mark 4, 6D Mark 2, 80D and 7D Mark 2. Exposure compensation whilst in Manual mode, and with Auto-Iso engaged. This is our preferred mode for our kind of wildlife photography. We use it in the four newer cameras but its not possible in the 5D Mark 3. In a post of this length it was not possible to fully describe every single feature in these five cameras, as they are all have deep menu systems and can be configured for many kinds of shooting requirements. At this stage we don’t make use of GPS and keep it turned off in our cameras, and we don’t use the Wi-Fi function either. We use these Canon camera bodies on the following lenses: EF-S 10-18mm IS STM, EF 16-35 L f4 IS, EF 24-70 L f4 IS, EF 70-200 L f2.8 IS ii, EF 70-300 L f4-5.6 IS ii, EF 100-400 L f4.5-5.6 IS ii, EF 300 L f2.8 IS ii, EF 400 DO f4 L IS ii and EF 500 L f4 IS ii. All of these cameras can take and do take images good enough for our requirements: fine art prints, for magazines, for our website and for social media output. But, as we have pointed out through this post, there are significant differences between them. Very good 35mm full-frame image quality, strong low-light capability, best Live View DPAF capability combined with swivel-tilt touch screen in a lightweight and compact form, intuitive to use. Good resolution for printing. Lack of AF multi-controller, moderate frame coverage for viewfinder autofocus points. Best 35mm full-frame image quality in this group, strongest low-light capability, best viewfinder autofocus, excellent control set with deepest configuration options. Strong Live View DPAF performer with fixed touch screen and robust construction. Raw images have best dynamic range amongst these five cameras. Best resolution for printing. Best APS-C sensor image quality although not as good as the full-frame cameras in this group. Very good Live View DPAF capability combined with swivel-tilt touch screen. Lightest and most compact camera body in the group. Intuitive to use specially for those upgrading from entry-level or compact cameras. No dedicated AF multi-controller, low light image quality compared to full-frame cameras. The 7D2 is perhaps the best wildlife action camera amongst them, if you find the image quality from its APS-C sized sensor acceptable, and even more so if you don’t shoot too much in very low light. If you like the image quality, then you don’t need much more than what this camera can offer. In this group, its strengths are its fast and accurate autofocus, deep buffer and by far the fastest frame rate. 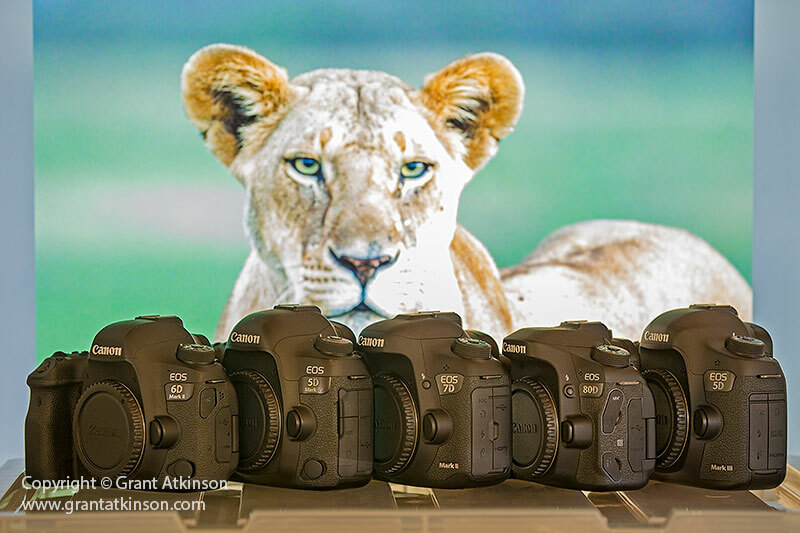 The tough build and highly-configurable control set, combined with good Live View DPAF performance (not quite as sophisticated as the three newer cameras) make it the best APS-C sensor Canon for us. Low-light image quality compared to full-frame cameras. Lack of touch screen. Fast and accurate viewfinder autofocus with strong 61 point coverage, good controls including AF multicontroller, bright viewfinder, decent resolution and good 35mm image quality at low to medium iso settings. Weak Live View shooting, no Exposure compensation in M-mode and Auto-Iso. We receive a good number of questions from people who are looking to find out more about one or another, of the cameras in this group. Getting the five cameras together and discussing some of their core capabilities, and strengths and weaknesses, as we find them for our photography, might just make it easier to decide which one is best suited to each photographers own preferences and requirments. Many thanks Grant for a most useful and comprehensive review. Hi Charles, thanks for the feedback! I was searching for a comparison like this for a while. I need to upgrade from my 5mkII before my next Bots-trip in October and I was hesitating if I should buy a 5mkIV or a 7mkII. I think you nailed my need of low light image quality and fast AF speed in your review. Great review as always. I have read many of your guides, particularly on set up for AI servo! I am a regular visitor to Southern Africa for 2-3 months at a time. I have used the 6D, 7D2 (sold it as it was a bad copy and Canon would not fix or replace it) and currently use two 5D4’s. I noticed many images (particularly) in Botswana, you are at or below eye level. How are you achieving that composition? Out of vehicle? On foot with guide? Thanks for the feedback. Also glad you get to enjoy your cameras in the Southern African wilderness, it is a fantastic place for wildlife photography. There are a number of ways that we get eye level or lower with our images – some vehicles we use have openings on the side (no door) or a cutaway, we make use of the tilt-swivel screen DPAF to be able to hold cameras away from our face and hang it down at ground level. Most of the time also we work in private concessions and conservancies that are adjacent to National Parks but where there is more leeway for photography. Certain places and certain species can also be photographed from the ground in some of these places :-). We really really like the perspective that shooting from eye level brings! Thanks for the explanation. 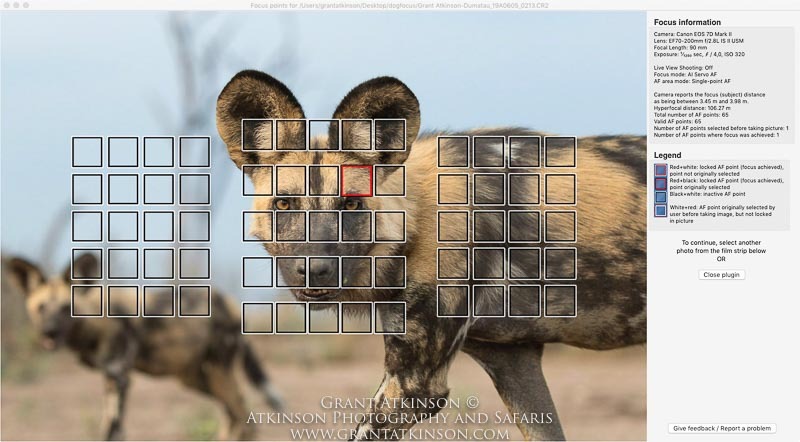 Now I am motivated to build a rig to be able to mount a camera on the side of the game drive vehicle to get a lower prospective! Most of the time I self drive in a HiLux, but later this year I will be spending a lot of time in South Luangwa Park in Zambia working with a camp who wants to add photographic specific tours in a open land cruiser rigged with built in camera mounts, etc. And nothing beats being in the bush with all of it’s residents! Thank you very much for this study. Very well written comparison review. 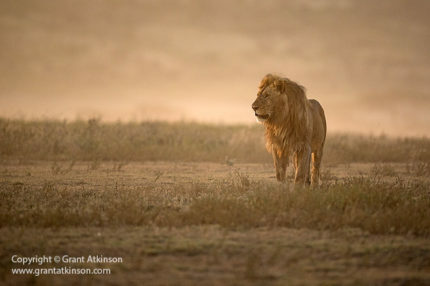 It strengthens the case that I made the correct decision in choosing the 5D mark 4 for my wildlife photography. Grant, as always your written and spoken explanations are clear and concise. Easily understood by both novice and pro alike. Keep up the great work. Hope to see you in the bush real soon. Hi Martin, thanks for that positive feedback :-)..always good to know the posts are helpful! Hi Grant, thanks for the extremely detailed comparison. I have the 7D mkii and have just bought the 5D mk iv. I plan to use both bodies on my next trip, one paired with my 70-200mm 2.8 and the other with one of Canon’s telephotos. The question is which lens should I use with which camera? Glad you enjoyed the comparison. When it comes to choosing a lens for which camera, some questions that we normally consider: Will you be able to get close to your subjects; Will your subjects be active around dusk and dawn only or during the whole day/parts of the day; Will your subjects be in open spaces or places with lots of vegetative structure; and will your subjects be likely to move fast. If you have some idea of any or all of those requirements it can make it easier to choose a lens that is well suited to your needs. Which lens or lenses where you considering in your question aside from your 70-200 f2.8? Thanks for the quick reply Grant, I realise my initial comment was a bit light on detail. I’ll be using the 2 cameras in your typical African safari environment, so early morning and late afternoon game drives. Of course you never know for sure whether you’ll see something close up or far away. Most often I’m not in a position where we are able to go offroad so I generally assume that cats / birds of prey etc are more likely to be far away and bigger game, elephants etc closer up. For that reason I normally pair the 7D Mk ii with my longest lens (usually the 200-400mm Canon) to take advantage of the extra “reach” the crop sensor gives you and the faster fps for action. 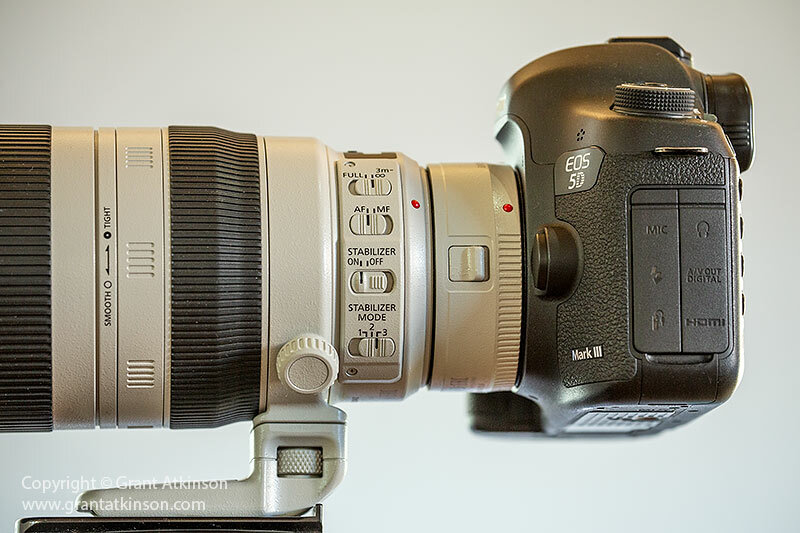 I would then mount the 70-200mm on the 5D Mk IV. Another reason for using the 70-200mm on the 5D is that I think I get better use out of the camera low light abilities of the 5D by pairing it with a 2.8 lens. HOWEVER I find I take the vast majority of my pictures with the 200-400 which makes me think the camera body I should be using most is the one with the best PQ and that would mean mounting the 200-400 on the 5D, taking the hit on the extra reach and fps. I think that both your reasons to use the two different cameras on two different lenses are valid, but for me I do tend to follow your logic of having the camera with the best image quality on the lens you take the most pictures with. 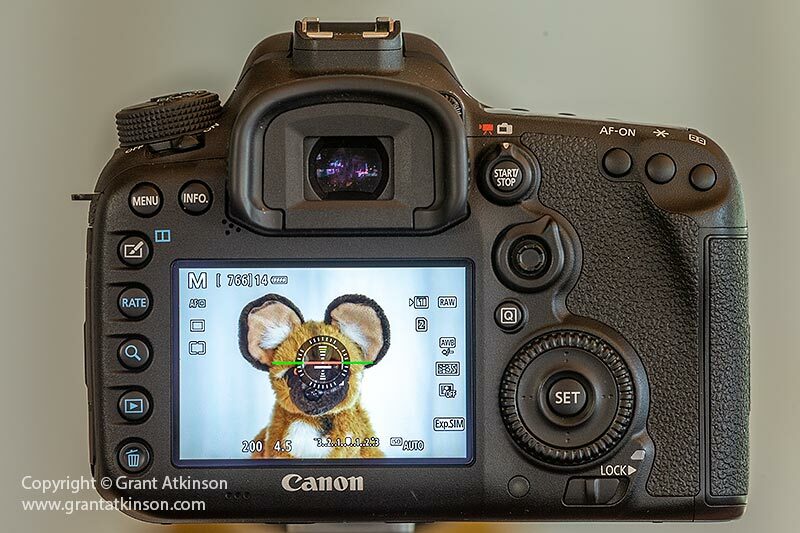 When it comes to ‘reach’, a 5D Mark IV image cropped to match the size of an un-cropped 7D Mark II image of 20 megapixels, will still have 12-13 megapixels which means that the resolution difference is not massive. And of course, on the opposite side, any time you dont have to crop away more than half of your image on the 5D Mark IV, you will see a noticeable improvement in image quality, in particular when shooting at higher iso settings when compared to your 7D Mark II. Of course, evaluating image quality is subjective. 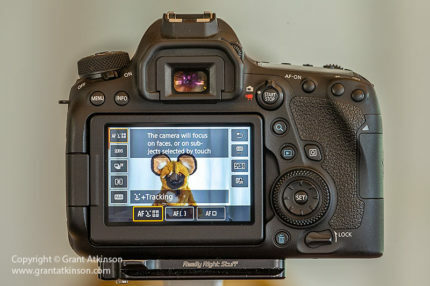 It is also possible to switch out the two cameras during the course of a day, should you find that your subject matter is in bright light, and you are not having to shoot at high iso settings, and is a small subject or far away, when the 7D Mark II image will give the most resolution. Another option that your set of two cameras and two lenses offers, is that of placing the 5D Mark IV on whatever lens is best suited to your particular subject as the sun gets low in the sky and iso settings need to go up at sunset. The same can go for sunrise. Having the 5D Mark IV on a 70-200 f2.8 will really give you a powerful combination that can shoot for quite some time after sunset and well before sunrise, provided the subject matter is close enough. Thanks for this comparison Grant. I find your articles and videos highly instructive. 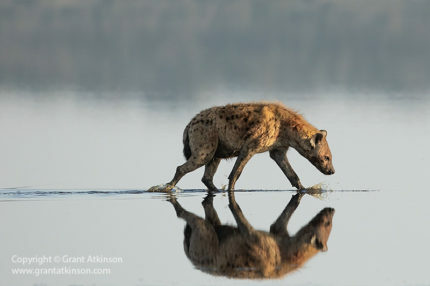 I am going to Lower Zambezi NP soon and was planning to use my 5d4 and 100-400Lii but was concerned what to do for wide angle work. I have the 24-70/4 and 24-105 but hated the thought of frequent lens changes from tele to wide and back while in the bush. I also have an 80d body but of the two wide crop sensor lenses I have I thought the 10-18 would be too limiting (all super wide) and the 18-135 neither wide enough nor good enough at the wide end. So I bought a 6d2 body which will be my wide angle camera with the 24/70 and I think this will be my ideal combination to take into the field. I do also have the 16-35/4. My remaining question is – if I need more reach than 400mm, would I be better with the 1.4iii converter on the 5d4 body giving 560mm, or use the 80d with its 1.6 crop factor giving 640mm equivalent? Both would give me multiple f8 focusing points, but I guess the 5d4 would be better in low light and could stand more cropping? Also – do you use AF microadjustment? You have a very well-considered approach laid out, and a similar gear bag to us. With wide-angle work we also usually prefer the 24-70f4 on a full frame body for its greater reach. Typically the times when the 16-35mm f4 is a better choice are when we expect to get super, super close to elephants, and when there are chances of clouds in the skies (which happens less in the dry season), which can make wider scene captures more interesting. With regard to the choice between 1.4x converter and 80D, it is a tough choice to make. The 1.4x converter is effective on the 100-400 IS ii but the maximum aperture drops to f8, so it is most useful when the ambient light is quite bright. But it can still deliver images that are well-detailed and good enough for print, when used with care. Given the 5D Mark IV high resolution, this does give you a combination with good reach. I do find that the autofocus with this combination is reasonably quick on static subjects but not as good on things that are moving fast. In comparison the 80D has a very good, super fine resolution sensor but we find that if one is far from the subject, and going to crop a lot, that it delivers its best results with heavy cropping up to iso 800. We try to limit cropping with it if we are going to shoot at higher iso settings than 800 for best results. I would probably go with the 5D Mark IV option and 1.4x extender if space or weight is a concern. If not then take along the 80D and you can even use that with the 1.4x extender on the 100-400 IS ii in good light, which is something we have done when trying to get decent pixel resolution on really small birds like kingfishers and waxbills. So far I have not found it necessary to carry out any AF micro-adjustments on our collection of Canon bodies and lenses but perhaps we have just been lucky in that most of ours seem to work well together. Hi Grant, I really enjoyed the comparison you did between these cameras.. That was a wonderfully comprehensive write up packed with fantastic photographs to illustrate the points you made. It must have taken you ages to do. I do hope it gets the recognition it deserves. And in addition to the review, the excellent questions and answers are all practically based making a very useful addendum to the original post. Thanks for your feedback, appreciated and noted as always. I am not the fastest at getting these posts written up, but I do enjoy the feeling one gets when I am finishing off with one. And the replies and responses are great, often adding helpful information that I may have overlooked in the original post. Thanks a ton for this extensive comparison, Grant! It has been extremely useful. 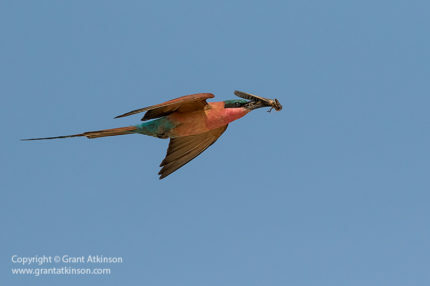 If one is moving from the 7DM2 to the 5D4, and uses the 100-400 + 1.4 TC with the 5D4, would there be any problems photographing birds of prey in flight due to the slightly lower FPS of the 5D4 vs the 7D2? Not small birds, big ones like cranes or eagles. Once again, thanks a lot for writing this post. That is an interesting question and my own preference would probably be to use the 100-400 without the extender for birds in flight. I have only achieved a moderate amount of success with moving subjects and the 100-400 plus 1.4x extender, more due to the focus becoming less accurate than purely due to the slower frame rate. I do find the focus better with the 5D Mk4 and 1.4x extender, than the 7D Mark 2 with the 1.4x extender, when mounted on the EF 100-400 IS ii. However, there are folk who have managed to use the 100-400 with the extender on both those cameras and get really good flight shots, just not me. Not sure if that was helpful or not. 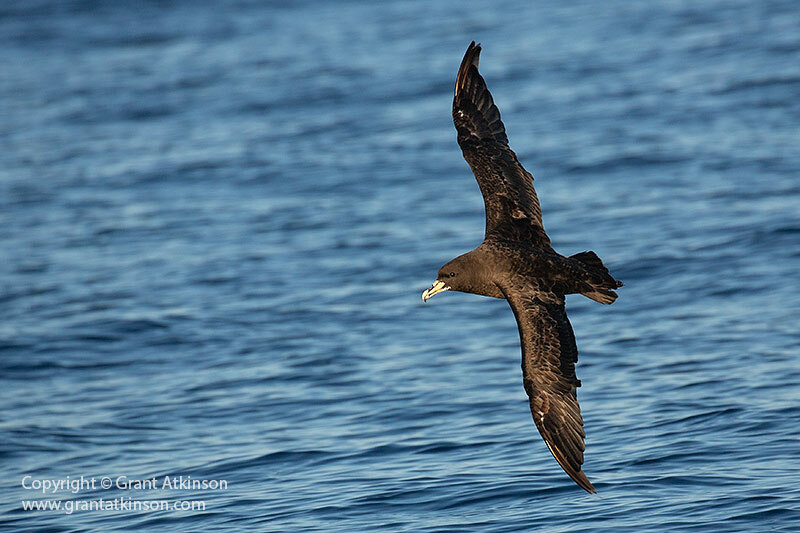 I do find the 5D Mark 4 to have really good autofocus for birds in flight overall. Thank you, Grant for the detailed response ? Do you run into any issues with the Buffer on the 5DM4? That has been mentioned as “average” under the cons section. Buffer size is average on the 5D Mark 4. As I realize that photographers differ widely in how they go about continuous shooting, maybe one way to give an idea is to compare it with other cameras, some of which you may be familiar with. For me, I only fill the 5D Mark 4 buffer on rare occasions. It has very similar buffer capacity to the 5D Mark 3. It has a deeper buffer than the older Canon 1D Mark 3, and 1DS Mark 3, the 5D Mark 2 and the 5DSR. The 7D Mark 2 buffer allows longer periods of continuous shooting without filling and clears faster (due in part to its smaller file size). To reduce the chance of filling the buffer during continuous shooting if there is something important to capture, it is usually best on the 5D bodies to shoot to the CF card drive only, and work with RAW images or JPEG only and not both. To maximise the frame rate and buffer performance also turn off all the image correction settings such as lens aberration, peripheral illumination, exposure optimisation etc as these all add to processing time. 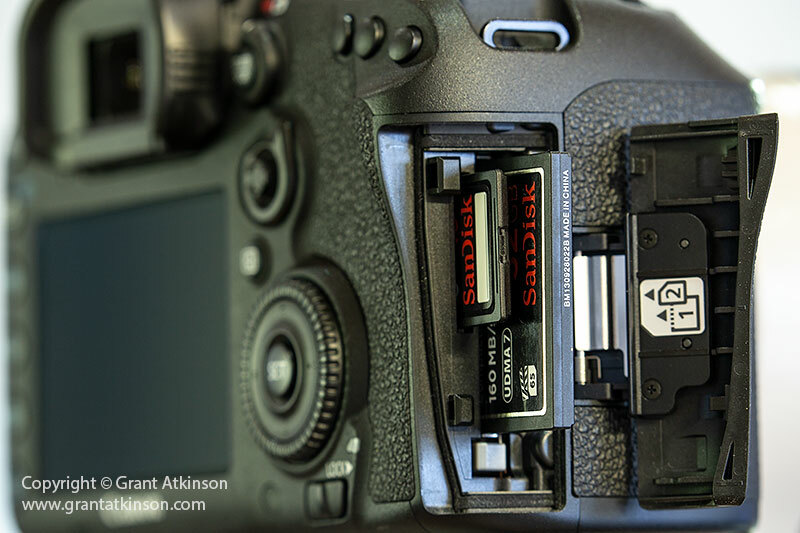 I’ve seen it suggested that it’s best not to have an SD card in the slot, even if you’re only writing to the CF card. Hi Nigel, that is all true, and turning off each of those jpeg processing steps will maximize the buffer performance. Some other options to turn off are noise reduction, highlight tone priority and D-Lighting. I agree with just using the CF card when speed and continuous shooting is important in the 5d series. This was very helpful. I have only used SD cards thus far, with the 7DM2 (Sandisk Extreme Pro something). I’m guessing that if I use just the SD card with the 5DM4, the buffer will fill up real quick. Is that assumption correct? I have tested this using Sandisk Extreme Pro cards, with the SD rated at 95MB/sec and the CF at 160MB/sec. With the 5D Mark 4 shooting to the CF drive only, I can get about 22 shots before the buffer fills. With the 5D Mark 4 shooting to the SD card only, i can get about 20 shots. So not a massive difference. However, there is a further benefit to the CF card because the camera becomes operational for shooting again about a second sooner when it is clearing a buffer-filling burst, than with the SD card. So overall maybe a 10 percent to 15 percent advantage to the CF card. With older twin-card Canon cameras like the 5D Mark 3 and the 1D Mark 4, the SD drive was significantly slower and there was a much bigger difference than with the more recent models. Thanks so much for the detailed explanation Grant! You are always very helpful. Do you have any opinion about the Sony A7RIII camera and their lenses, when it comes to wildlife? They seem to be making quite a splash. Hi Paul, i have not as yet managed to try out any of the three Sony full frame bodies, A7iii, A7Riii and A9, that look to be suitable for serious wildlife photography. Its good news that there are now three Sony telephoto lenses at least, which are suitable for wildlife photography, the 70-200f2.8, the 100-400 and the new 400 f2.8. I have had a look at the cameras in my local store, and am still hoping to get to try one/them out and learn how well they work. Thanks a ton, Grant for the detailed explanation. Extremely helpful! Thank you for patiently answering all our questions! And apologies for asking so many of them..
Having read this post for the 5th or 6th time, I paused to think about “Assuming no cropping with the raw files from any of the five cameras” in the Image Quality section. From a noise perspective, what is your take on cropping? Some people say, that the 5D4, when cropped down is equivalent to a 7DM2, just better in terms of shadows. Philosophically, I wonder whether the higher MPs provided to capture more “detail”, or are they to be used a a way to “post-magnify” a subject because the focal length was too small to magnify it “in camera”? How much cropping, do you feel, is appropriate on the recent cameras like the 7DM2, or the 5D4 in low light? Is there a cropping limit to adhere to, on APSC vs FF? Personally, I have learnt a lot from looking at the photos you post. And also received a lot of inspiration, especially in the focal length area, as my longest focal length is 400mm on the FF. (Maybe 560, if I use the TC.) Seeing how you select backgrounds even with these focal lengths, and create a work of art, is a big learning in itself for folks like me :). The resolution, crop and full-frame sensor and noise discussion can seem complex and there is a high degree of subjectivity involved when it comes to evaluating noise and image quality. Usually such discussions invite widely differing opinions. Some of the different opinions seem to arise from the practice of viewing and comparing a cameras output on a computer/editing screen, zoomed in to 1:1 or 100 percent, without taking cognisance of the actual size that image would occupy in its entirety or in a print, when cameras with different pixel sizes are being compared. I have found it invaluable to learn the pixel sizes of the cameras I use, in order to help me have realistic expectations of their image quality. Amongst the cameras I shoot frequently, the 80D and 7D Mark 2 have small individual pixels (4 microns or less), the 6D Mark 2 and 5D Mark 4 have medium sized pixels (5.7 and 5.3 microns respectively) and the 1DX has large pixels (over 6 microns). How much cropping I will do personally depends on how sharp the raw image is, how low the iso setting was, and how bright the ambient light was and also depends on what camera I was using at the time. I also keep an eye on the number of pixels on the horizontal side and the vertical side in the editing program when I am working on the raw images. That helps me remember and learn particular camera output easier. With the 7D Mark 2, if I have a sharp shot anywhere between iso 100-iso 800 I would be happy to crop the long side down to around 4000 pixels and still be able to print the image to A4 (magazine) size. For internet I am happy to crop a similar image down to about 1000 pixels. These are rough numbers. If I have shot the 7D Mark 2 at iso settings higher than iso 800 then I would prefer to crop much less than, and I try to frame as carefully as possible when shooting at high iso. I think more pixels do capture more details, and they do allow you to print larger, or crop deeper to magnify a small subject. It may also be that cameras with small pixels are hard to shoot as sharp as those with larger pixels which can be a disadvantage. In the post on this website on shooting the Canon 5DSR for wildlife, i tried to share some findings from the field of shooting with cameras with high numbers of small pixels (5DSR) under the section on Image Quality. I do also agree that if a 5D mark 4 image is cropped so deeply that it matches a 7D Mark 2, that the image quality advantage lies mostly in cleaner shadows. Fortunately I am able to get close enough to many of my subjects that I dont always have to crop that much so I can benefit from using more of the sensor area. 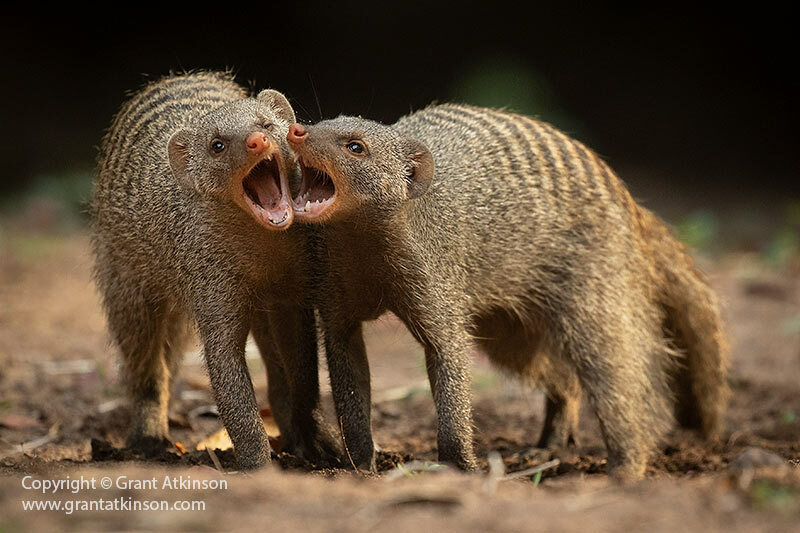 With regard to the images I get at 400mm and 560mm, I am extremely fortunate to be able to spend lots of time photographing in well-protected wildlife areas where I get many opportunities and sometimes very close. I know that it can be much, much harder when trying to take strong wildlife images in places where the animals are shy or scarce! This is a fantastic comparison piece. I have both the 80D and the 6D Mk II. I do not photograph professionally but do take quite a few images of family members, events, etc. The 6D Mk II allows me to use all of the wide end of my zoom lenses (particularly the EF 17-40 f4 L) and works exceptionally well in low light. I have been using the XXD series Canon SLR’s since the release of the 20D and with the 80D I am able to stretch the long end of my longer lenses, and its control layout is similar enough to the 6D Mk II that they are practically identical, which is an enormous benefit. But as you noted in your great review, the articulating LCD screen is what makes both of these bodies so versatile for low angle work. Having used an articulating screen since the release of the EOS 60D, I can’t conceive of using a camera without one now. I consider it a good time to be a photographer, given how many good choices we do have. As you already have the 70D it should be an easy decision. If you want the most similar image quality and high iso capability to your 5D Mark 4, then go with the 6D Mark 2. You are already aware of its form and shape, from your 70D to which it is near identical in layout and size. It adds an extra level of flexibility to my gear bag with its swivel tilt screen. On the other hand if you want a camera with the most speed and responsiveness, and with image quality just a tiny bit better than your current 70D, then the 7D Mark 2 is it. The 7D Mark 2 is the most similar to your 5D Mark 4 in terms of size, feel, viewfinder size and controls etc. I will add some suggestions when I have some more time regarding which lenses etc to use on which bodies for those trips here in this thread. Hi Elize, I believe a used 5D Mark 3 would be a better all-round body for wildlife specifically where low light is a consideration, and you can pair it with lenses of sufficient focal length as you already have :-). Think that the used prices on 5D Mark 3 bodies are quite good these days…. Helena and I owned three of the 5D Mark 3 bodies and they where solid performers. Biggest drawback to the 5D Mark 4 is image quality above iso 3200 and the irritation of not being able to do Exposure Compensation when using M-Mode and Auto Iso.. Thanks a mil. I think you have settled it for me and I will be looking out for a previously loved 5d mk iii. I never shoot in manual (except in studio), so if I can use Exposure Compensation in AV (which I use permanently), then I will be fine. I also hardly ever use Auto ISO, so even that I can live with. The ISO is a concern, but I guess unless one forks out for a mk iv, you have to make do! Have a great week. In response to the discussion around which bodies and lenses to use where, my experience of the Galapagos and the Pantanal where quite different when it came to which lens I used most. When you are carrying a combination of camera bodies with large sensor (5D Mark 4) and smaller sensor (70D or 80D, 7D Mark 2), as well as three or four lenses it can be overwhelming trying to decide. For myself, I try to use the lens with the focal lens or lens that I am doing the most work with. Also, what is a strong consideration for my shooting, is the fact that many of the species that we spend lots of time looking for, are active at dawn and sometimes at dusk or even after the sun has set. With that consideration, I select my full frame 35mm sensor bodies ahead of crop sensor bodies, subject and location dependent. For the Pantanal (and the areas you visit may differ? ) I shoot about 70 percent of my favoured images with my EF 500L f4 IS ii. That includes jaguars and birds. I do sometimes put the 1.4x extender on that lens. I choose to use it with the 5D Mark 4 whenever I can. 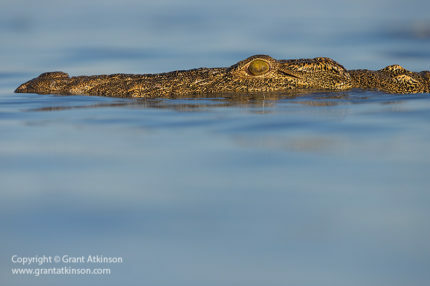 I take the EF 100-400 IS ii as my zoom telephoto for the Pantanal as I find the 70-200 too short. I take along the 24-70 for landscapes. Ideailly for the Pantanal I will have two 5d bodies and then the 6D Mark 2 as my third body and to use on the wide angle lens. In your case, you already have the 500f4, the 100-400, the 16-35 and the 5Dmk4. Either a 7D Mark 2 or a 6D Mark 2 would make for a good second body, but the 6D Mark 2 has a lot stronger low light capability than the 7D Mark 2 when natural ambient light is low and subjects or boats are moving. For the Galapagos, I used the 16-35 much more than the Pantanal because many of the subjects in the Galapagos can be approached to very close distances. 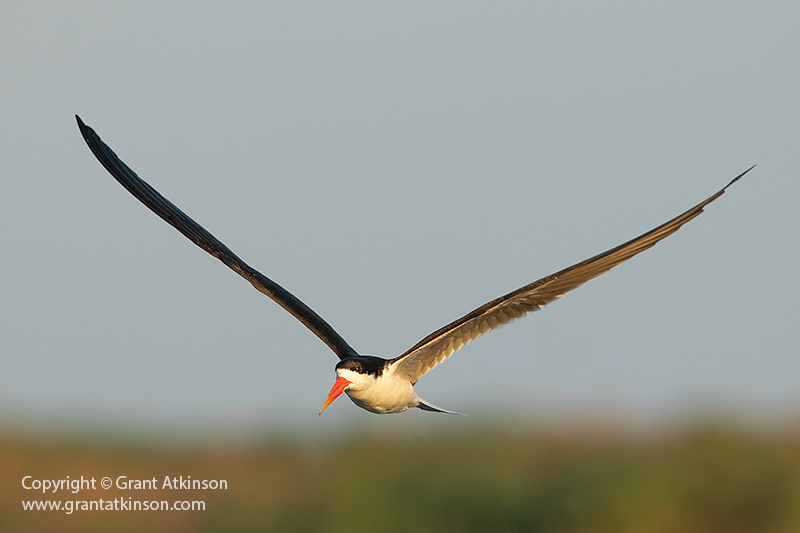 The close focusing distance of the EF 100-400 IS ii also makes it a very powerful lens for the Galapagos. Of course there are still lots of chances to photograph birds in the air with the EF 500 both on the islands and from the expedition boats. Nigel also has a great comment about the wide angle perspective to keep in mind with your current lens set and the difference between the field of view that exists when using either a 6D Mark 2 or an 80D/7D Mark 2/70D. Thanks again, Grant. You go to so much trouble that you make me feel guilty! I was planning to use the 5d mk iv with 500 lens for most of the Pantanal as that one with the 5d mk iv is definitely my preferred combination, as you said, with or without the extender. Last time I lugged my 70-200mm along, and ended up never using it. However, I do use the 100-400mm a lot when walking or handholding – or of course for that one jaguar swimming right next to the boat (wishful thinking)! My plan was, again agreeing with your mail above, to mostly use the 100-400mm on the Galapagos (walking) and then use both the 100-400 and the 500mm on the boat. I guess in the light of what Nigel mentioned above, if I wanted to use the wide angle it would make sense to bite the bullet and get a 5d mk iii as an extra body. For sure you can do Exposure compensation in AV on the 5D Mark 3, and as a direct replacement for your 70D it will give you larger print resolution, superior autofocus specially for fast moving subjects, and improved image quality at all iso levels. It is also very, very similar to shoot side by side with the 5D Mark 4. I will be interested to hear your feedback on how you like it if you are able to find a good one. Remember to use the CF drive only if you are going to be shooting action on it. 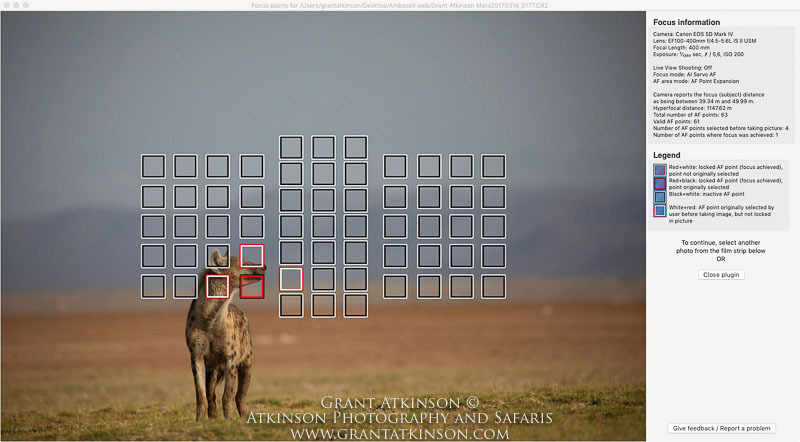 Grant, Thanks a mil for giving me “focus” – I have spread the word that I’m looking for a 5D mk iii. I tend to prefer the CF drive in the Mk iv over the SD card – it is faster than the SD card (even though I buy the best SC cards that I can afford). Is it not so with the 5d mk iii? Super super review ! Practical, to the point, usefull and with a lot of real examples ! Another consideration is your need for wide angle. You mention a 16-35 lens. Obviously on a crop body, either 80d or 7d2, this will not behave as a 16-35, it will be equivalent to 26-56mm, which is not so wide. if you want the wide angle coverage, you would be better off with the full frame 6d2. It’s also useful to know that a 6D2 and an 80D are very similar in size and weight (I have both and can confirm this). Thank you so much, Nigel, for the very valuable comments. I guess my doubt about the second body was very much based on the issue of the crop sensor body. I felt that if I throw out my 70D and get a 7Dmkii, I would end up with very much the same thing (slightly better quality), and out of pocket for something that does not really meet my requirements. 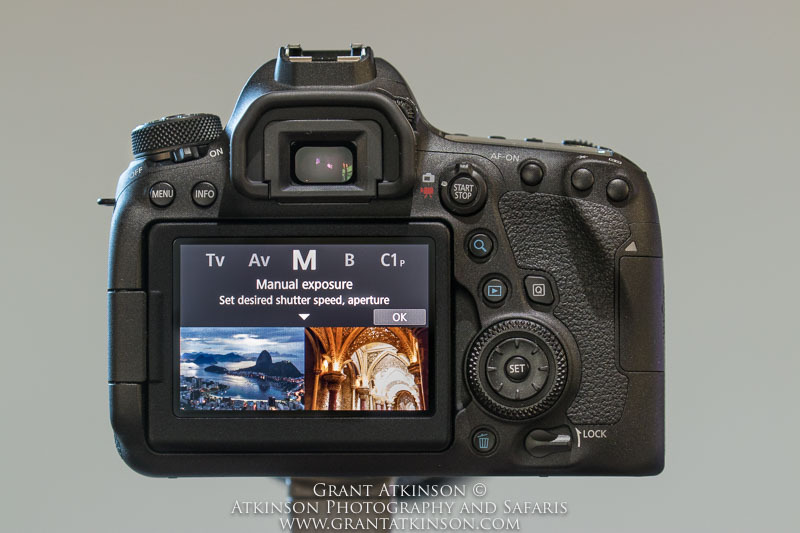 Of course if one had deep pockets, this discussion would be unnecessary – a second 5d mk iv would be the ultimate, but as an amateur it is not an option! When shooting in Ai Servo, I shoot most of my images using a Single AF Pt, or also with AF Expansion (one point plus four helpers). I find that both these options are fast to lock onto subjects and are accurate which is important when using telephoto lenses with shallow depth of field. I do sometimes use AF Zone but only if the subjects are large in the frame and not moving very fast. 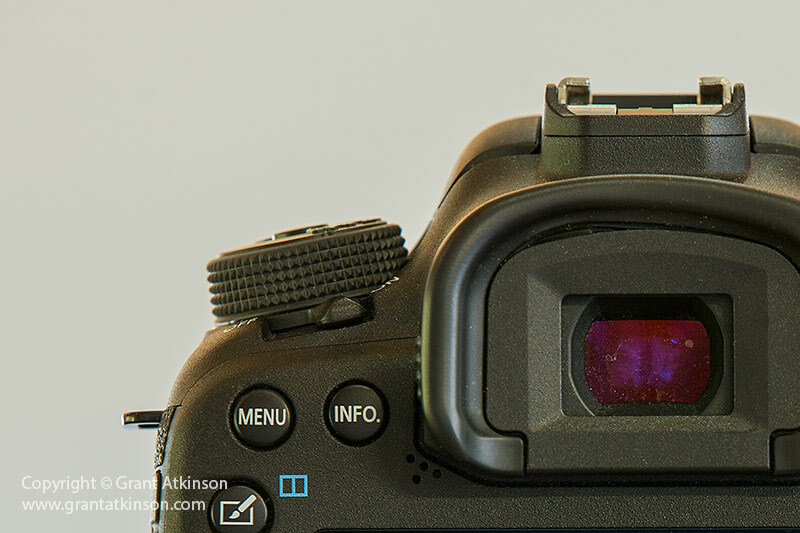 The autofocus system in the 5D mark 4 I find is only bested by the 1DX Mark 2 in Canon’s cameras. Recently, someone pointed me to a page of the 7D2 manual and the 5D4 manual where they have a long list of conditions needed to meet 10FPS. Is it better to have the camera restricted to 6-8 FPS, to avoid taxing the system when those conditions are not met? On a related note, in your experience, on any camera, does 7-10 FPS Increase the chances of some jitter due to the mirror impact? Conversely in your experience, would a high FPS reduce the tracking efficacy on an older body? Sorry about so many questions! And thanks again for patiently answering to them! Hi Paul, those are really good questions. I don’t think there is any chance of ‘taxing the system’ when the camera cannot manage to operate at its maximum speed frame rate, usually any slow down comes about mostly because of longer periods required for focusing and the good thing is that Canon allows one to bias one’s camera to more time or less time between frames via the Ai Servo 1st Image 2nd Image menu. When Focus Priority is chosen, the frame rate may fall right off to 3 fps when conditions for autofocus to operate are difficult. As for jitter, I have not noticed an increase in shaken images due to shooting at high frame rates, but I do know that the 7D Mark 2 as well as the 5DSR series cameras all had significant technology improvements in their mirror/shutter mechanisms which would lead me to believe that the earlier models of those cameras probably suffered from shake but I was likely not aware of it. Thanks Grant. Seems we are on the same page as to settings! On my way to Southern Africa for 2.5 months! What I appreciate most about your feedback is that you share everything you have experienced! The 6DM2 seems to have its focus points closer to the center, as compared to the other Full frame cameras. Is that something one should consider if the primary goal is to use it as a backup body for wildlife? Hi Paul, it is true that the 6D Mark 2 focus points dont spread that far toward the edges of the frame. When I am using it for telephoto shooting, my subject matter is more often toward the central part of the frame and I am able to place a focus point where I need to. However, the 7D Mark 2 and 5D Mark 3, 4 and 5DSR focus grids all extend higher and wider and make it easier to select a point further off-centre. There are ways to work around getting focus toward the edges of the frame, like making a button on the back of the camera temporarily lock the focusing (I usually use the AF-On button for this) but it is not as good as having an active point there. 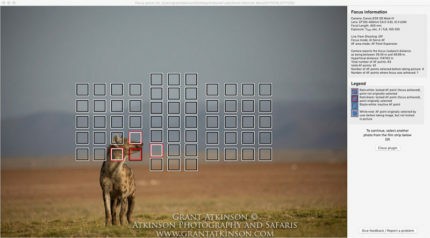 It is also possible to use back-button focus to enable focusing outside the grid. When I am using wide angle lenses I find it happens more often that i want to place a focus point outside the grid of focus points, so again I use the AF-On button to lock focus. As the Live View DPAF is so good and it has AF point coverage over about 80 percent of the frame, I also use my 6D Mark 2 a lot of time in Live View when using wide angle lenses. You can also switch from Ai Servo to One Shot focus to allow lock and recompose. Whilst having greater AF point coverage in viewfinder autofocus does make composition easier, and working with a subject close to the edge of frame easier, I have also found that with all my Canon bodies, that I get a higher keeper rate with subjects moving at medium to fast speed if I avoid the outermost ring of AF points and work just one row in. This goes for focusing in low light as well for me. I have mentioned this in my review of the EF 100-400 IS ii. I believe it to be due to the fact of light falloff from the lens towards the edges of the frame. 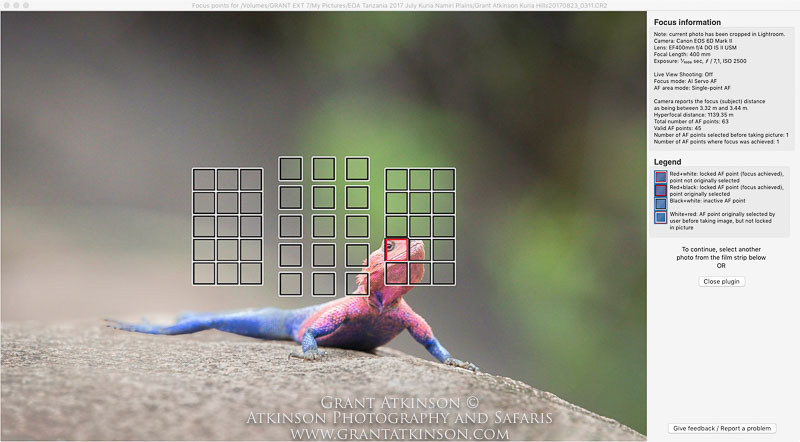 But for static subjects in viewfinder focus I would definitely like more points near the edges. Gosh, and here I thought there was something wrong with me for hating the fact that the focal points are generally grouped in the middle! Hi Elize on the 5D Mark 3 the CF card drive is very fast whilst the SD drive in that particular camera is very slow, perhaps half the speed of the bigger format cards.. Thanks, Grant. I find the same on the 5D mark iv – the SD drive is slower than the CF drive, so I tend to mostly use the SD drive. Correction to my remark above – I tend to use only the CF drive in the Mark iv, because of speed. So – once again, you are absolute correct, Grant. I have been photographing birds with 600D (Rebel T3i) with 400mm f5.6 lens. Although I got many sharp images of stationary birds, flying ones remained a big challenge. 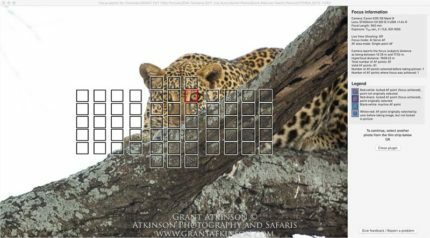 Either AF keeps hunting or focuses somewhere else. I am complete amateur, but would like to buy tough and dependable camera body that last several years (may be 10+ years). While I looked for reviews, I came across yours. Your videos on AF of 7d mark2 is excellent to say the least. Hence I am considering buying it. Now the big question is whether I should wait for an upgrade (7D Mark3) as mark2 is four years old, or simply go ahead and buy Mark2? Will I be missing a lot by not waiting? Do you still find 7D mark 2 relevant in 2018 and use it? I am certain that the 7D Mark 2 is a big upgrade in autofocus for moving subjects, over your 600D. It will focus faster initially, get you more frames, and also allow you to fine tune the autofocus performance for your own preferences and to best match the subject matter that you are taking images of. I have no idea of how much of an improvement any upcoming 7D Mark 3 might represent, so it is not easy for me to say which one will be better or whether it will be improved significantly for birds in flight. For my own bird in flight photography, I find that i get more properly focused images if I am able to learn or predict some part of the birds behaviour or flight path, as opposed to trying to just photograph any bird as it suddenly takes off or appears overhead. The further away I can see them coming, the higher the chance that i am able to get well focused images, and that holds true for whether I am shooting with a 5D Mark 4 or a 1DX or a 7D Mark 2. So it is a little difficult for me to fully understand the particular bird in flight scenarios you are describing without being there or having more information. We do still own a 7D Mark 2 and as we prefer to use it when we are shooting with good light as opposed to times when ambient light is very low. Thanks a lot. It is very nice of you to have replied with such details. I live in Chennai (south of India, on the coast). It’s a land of blasting sunshine, hence no shortage of light on most days. That’s the reason 400mm f5.6 does a fine job here. I think I’ll go for 7d mark2 and watch your video tips on AF a few more times to get a hang of it. Hi Anirban, the 400 f5..6 and 7D2 is a good combination that many fine bird photographers put to good use all round the world…so I hope it proves effective for you! Grant, Following your advice to get a 5d mk iii camera as a second body in addition to my 5d mk iv, I undertook my first outing to the Kruger National Park. I used my 100-400mm lens on the mk iii, and my 500mm on the mk iv. What an absolute joy! It made the world of difference being able to simply switch cameras when the subject was too close for the 500mm, giving me peace of mind that I won’t have to miss a shot. As you said, the mk iii is so similar to the mk iv, that it is easy to switch cameras. I do miss the touch screen on the mk iii, especially when moving through the menu. Still have to master how to return to the main menu icons quickly, and move from one main icon to the other instead of running through all the detail. The major difference in handling, I find, is the ISO button on the mk iii is much more rigid than on the mk iv – one really has to push it in hard and decisively, whereas on the mk iv you literally just have to touch it. Once I got my mind around that one, things were easy peasy. By the way, I am now at a stage where I feel that adding an extender to the 500mm is simply a waste of time, as it looks as though one gets very much the same effect by cropping. The extender tends to “soften” the images – or is it just my imagination? Thank you again for your very solid, generous advice. Glad you are enjoying the 5D Mark 3. You can make use of the Q button on the rear of the camera to skip from one main menu to the next. The difference in the feel of the iso buttons sounds more like something that is peculiar to one of your cameras, as I didnt notice that being something noticeable between those bodies. For sure the extender does lead to a slight loss of very fine detail, most noticeable if the light is low. However if you are in a good location, and the light is bright, allowing for fast enough shutter speeds at low to moderate iso settings, (combined with any rare occasion that a subject stays around for long enough) then you can get some shots with the extender in place and without. I find that the extender is useful in the Pantanal for those jaguar sightings that may last for a long time and when they sit still. Cropping is also an option though, specially as the image output from prime lenses like the EF 500L f4 IS ii are so good to begin with. Firstly let me thank you for the most comprehensive review I have ever come across. I am looking to upgrade my camera body from an entry level Canon DSLR. My hobby is wildlife and bird photography. I occasionally use my current Canon DSLR (1300 D) camera for indoor photography I am a bit confused between the Canon 80D and 7D Mark II and not able to make up my mind. I am not too much into taking videos. Additionally I currently own a Sigma 150 – 600 Contemporary lense which I would continue using. Can you please offer your guidance on which of the two bodies should I go for. Thank you in advance. Feel free to ask if you have more specific questions about differences in the cameras. Thanks a lot again, Grant, for your advice re the 5d mk iii and iv. They are both super. I will have the mk iii checked to see if the ISO button can be made more sensitive. It is brand new (had 1 actuation when I bought it), so maybe it needs a bit of use. The EOS R seems to surpass the 6DII on most counts, except for 3 aspects. (2) Some “potential” Lag in the EVF just because nothing can be faster than light? I am quite keen on evaluating it as a backup body for a 5D4, instead of the 6D2. That is an interesting comparison for sure, and one that I am also thinking about already. We are likely going to buy an EOS R as soon as they become available. 1:) battery life will be shorter on the EOS R.
2:) I am thinking that we may have to wait until actual use to see how significant the EVF lag is, if any? 3:) The EOS R has a shutter lag of 50ms which is very short, and could make for a more responsive camera than the pure specifications alone indicate. Many of the early ‘previewers’ of the camera are mentioning rapid initial AF. If the DPAF is accurate at 5fps in Ai Servo operation, it might still compete well with the mid-class AF accuracy of the 6D Mark 2 at 6 fps. I’m totally unsure whether to go 6dII or 7dII. I greatly appreciate your comprehensive comparison. I shoot alot of birds in action but also still wildlife. The 10 fps is certainly attractive as well as the dual card option for memory. I’m sure I won’t have many regrets either way but want to make sure I’ve done my homework to get the best pics. Thanks for writing. What camera do you use right now and what would you most be looking to improve by changing to one of these? Maybe that information would be helpful in me offering some more thoughts? I’m shooting the 50d. While old, I’ve been very happy but am eager to see how this next investment enhances my captures. Either of those cameras is a good upgrade on a 50D. Thank you very much for your guidance. I have finally decided to go in for the Canon 7D Mark 2.
b) My interests are largely around wildlife photography. Unfortunately not much of sporting action in India apart from Cricket. c) I am able to hold the Canon 7D comfortably with the Sigma 150 – 600 lens. But in any case I will have a Tripod & Monopod when required. Will reach out in case I need any specific tips. I hope it does well for you. I think that the 7D Mark 2 will be a good choice! Hi Grant, great review. Looking for some advice…I currently shoot with a 60D and the 17-55mm f2.8 and 60mm f2.8 Macro. I mostly do Landscapes which can vary from early morning to late evenings so the problem with the 17-55mm is it’s really a 27mm at the widest. I am considering a 5D MKIV matched with the 16-35mm F4. I looked at the 80D but not sure how big an upgrade it would be from the 60D if I decided stay on crop sensors. Any advice would be extremely welcome…ps I thought upgrading camera gear was simple 🙁 Many thanks David. Sorry for the late response, I was away. The 5D Mark 4 combined with the 16-35 f4 would be a solid upgrade over your current lens when it came to a wider field of view especially. If you are shooting with a tripod and can afford to make use of low shutter speeds, thereby keeping your 60D around the iso 100 and iso 200 range then perhaps you have less need of the image quality advantage that would come if you shot at higher iso settings. The 80D is a slight but significant upgrade on the 60D when it comes to resolution, also lower noise at iso settings from 400 upwards. Just about everything else is a little better on the 80D than the 60D and it would offer good performance gains for less money. 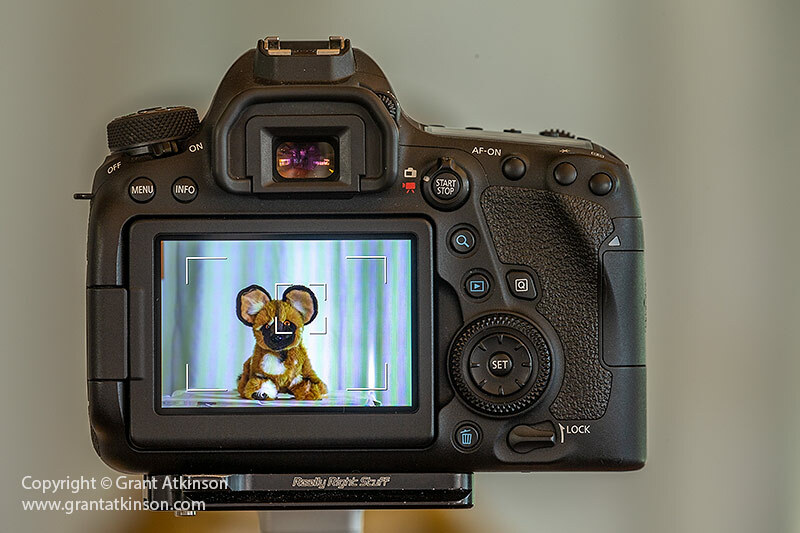 Getting the 5D Mark 4 and the 16-35 would give you wider focal length, much improved autofocus, greater resolution, and about a two stop or more improvement in high iso noise over the 60D. Image quality is really interpreted subjectively, so those are just my opinions on the cameras output. Hi Grant, thank you for taking the time to answer my query, it is very much appreciated. I do shoot most of my stuff with a tripod and have found 160iso on the 60D seems to come with the less noise. The 5D Mk4 looks a fabulous camera and maybe more than I really need and you raise a very valid point about image quality and how it is perceived. I think the 6D Mk2 with the 16-35 f4 would be a better and less expensive way for me to enter the realms of full frame photography and give me that wide view point I desire. Thanks again for your expert help Grant. Kind regards David. The 6D Mark 2 with the 16-35 f4 works very well together, and it ought to provide quite a seamless transition from a 60D in terms of size and controls and weight. You would enjoy the much greater field of view, very accurate and consistent DPAF focusing in Live View, greater resolution, cleaner image quality, as well as superior focusing in low light in any mode as some of the more noticeable improvements. I would also think that with the newest round of full-frame cameras just landing in the marketplace, it might happen that the 6D Mark 2 becomes available at some good prices? To help David, I have both the 5dmk4 and the 6dmk2. The difference in image quality is minimal to be honest. I have made a2 size prints from both, no visible difference, both for landscape. I think the 6d2 is excellent value, is lighter (similar to 80d) and has the benefit of an articulated screen, which is great for unusual camera positions (high/low etc). Currently available between 1000-1500 gbp in the U.K. email me for details of best uk price. I agree you wont see much difference in A2 sized prints from those two cameras, they both make very high quality prints, specially when there is minimal cropping. Hey Nigel, thanks for the input and it’s great to have the experience of someone with shoots landscapes with both cameras. I was worried by some reviews that the DR on the 6D Mk2 was poor at lower iso’s 100/200 etc., resulting in poor shadow and highlight recovery in Lightroom but I think some of the comments have been over critical and a bit of camera bashing at Canon to be honest. I think between Grant and yourself you have convinced me that the 6D Mk2 with the 16-35 f4 is the best option for myself and keep the 60D as a backup. I’m not sure if something like the 6D Mk2 will be discounted with Black Friday coming up but who knows!!! Thanks again guys. Stellar review as always!!!! I do enjoy seeing your Africa photos on facebook. I have a nagging question with my 7D ii. I understand that Case 1 is the default Case. How do I set up to use a different Case. If I want to use Case 4, how can I ensure that is the case I am using when photographing??? Hi Joseph, there is more than one way to achieve that, but my preference is to add the Three Menu itens: Ai Servo Tracking Sensitivity, Accelerate/Decelerate Tracking and AF Point Auto Switching to the green My Menu option on my 7D Mark 2, that way i can access those three sliders instantly and also I can set them quickly from the My Menu screen. Whatever numbers you dial in on the three sliders in the My Menu screen will be the default settings. I do have a step by step Youtube video going through that setup. Your reviews, instructional blogs, and YouTube videos have helped me allot, Thank you. A little background I am a hobbyist/enthusiast returning to photography after a 30 year absence, my career got in the way. Going from film to digital was a learning process. Pictures are for my enjoyment/challenge of getting the shot and for friends, displayed on a 4K TV driven by a mac mini, no prints, no interest in video. Earlier this year I did pick up a Canon 80D, with 100-400L, and 24-70, and produced a number of great shots. My thought was it is better to spend on glass versus processor, and I can change camera/add bodies later. Now I am retired engineer and ready to travel to take photos starting late next year. I really enjoy taking pictures of wildlife. So it is time to add the second camera to the bag, for a couple reasons, 1) I live in the centre of Canada, so going anywhere is a long trip, so having a backup camera is required, 2) I don’t like changing lenses in the field as there is now a sensor to care for (it used to be having different ASA in each camera). With the sales I have been seeing for Black Friday, it looks like there is a product upgrade coming. I am kind of struggling, the 5D Mark IV price is dropping. So add a full frame, FPS is the same, or wait for an updated 7D Mark III (when it comes) more FPS, probably more modern processor, and then there is cost of FF vs APS. Both the 5DM4 and 7DM2 are old technology. So I guess my question is, is it better to carry 1 FF even though it is older or 2 APS assuming the specs for the new are better, which logically they should be? Once again thank you for sharing your blogs and videos. Thanks for the feeback on the site. If you are asking whether you are better off using one 5Dmk4 body or two APS -C bodies that is a difficult question for me to answer. It will depend on how much you dont like changing lenses in the field, how many shots you may miss because of having to switch out lenses and bodies etc, and also to some degree on how close you are getting to your subjects. You will know those things with regard to your shooting situation better than I do. I can give some idea of how I see the 5D Mk4 capabilities in comparison to the 80D, as well as what may replace it in APS-C form. The 5Dmk4 has better autofocus in terms of low light capability, also accuracy with one point or more, than the 80D by some margin. It also has lots more controls and they fit somebody with a bigger hand very well, making it more intuitive and faster to shoot for many users including myself. This is helped by the big and bright viewfinder. Then the FF 35mm wide sensor in the 5Dmk4 is much larger than the sensor in the 80D so it offers superior image quality. This becomes more and more noticeably from iso 800 upwards. If you shoot at iso 100 or 200 then you wont notice it so much. Cropping the 5Dmk4 image till it matches the subject size of the 80D leaves you with about 12-13 megapixels of resolution on the 5Dmk4. 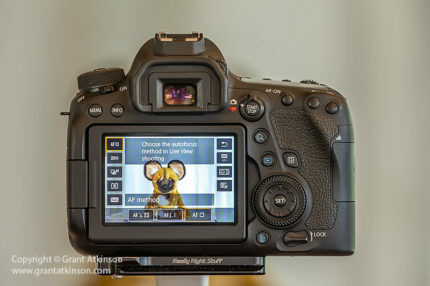 If, right now, you are shooting with your 80D and your 100-400 at its maximum focal length for most of your preferred images, and still having to crop away some of the 80D frame to get your subject large enough, then you will not benefit much from improved image quality of the 5Dmk4. The 5Dmk4 image quality advantage becomes evident anytime you crop away less than 50 percent of its frame, approximately. The 5Dmk4 is also much tougher than the 80D in bad weather or for prolonged use in rough conditions. Whilst it is in its third year on the market I think that sensor improvements are coming a little more slowly these days, so I would not expect a brand new APS -C to beat it in image quality, if you dont crop the 5D Mk4 frame more than half, that is. You may be better served getting the replacement for the 80D to be a second body, and keep your existing 80D if you are happy with the 80D right now. 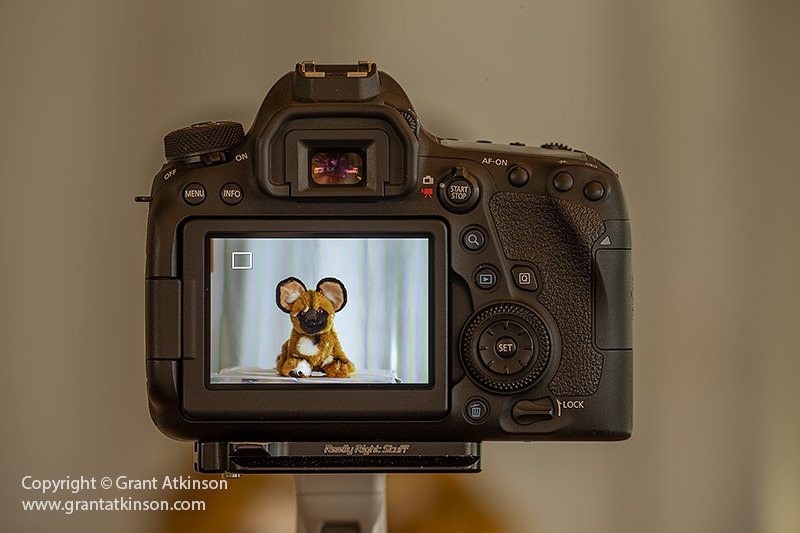 If you are happy with the image quality you are getting from the 80D right now and mostly shoot at lower iso settings then you could also buy a 7D Mark 2 as a second body, though its sensor is a little older it still works well up to iso 800 and a bit beyond. It has excellent speed, is tough, big buffer and is a fun camera to shoot with and its autofocus is closer to the 5Dmk4 in its performance than the 80D. How you feel about the image quality you are getting right now from your 80D may lead you in a good direction? If you are happy with its image quality then a second APS – C can be a good option..
For myself, I shoot a low of the subjects that I favour when the light is low because that is when they are most active, so I prefer when I am able to use full frame for that purpose but my situation is not the same as yours. Hope something there is helpful to you in your considerations? Thank you to everyone for your feedback. The images I am getting do look good the way I am displaying them on a 4K display. I do see grain when setting to 100% during reviewing and editing in Luminar at high ISOs. But even at ISO1600-2000 on the display grain isn’t noticeable. Thanks Nigel for explaining downsampling. As for cropping some more than others, the additional reach to 640 helps. Most images are cropped to 16:9 to match the display. Where I live right now, I am a 20 minutes from a nature preserve, so I can pick the day I go. It is when I start travelling, I won’t have that luxury, I will have shoot for the conditions of the day, but given the way I display them, I am thinking saving by getting 7D2, which leaves more to spend on other things like 10-18mm and a 1.4x. This has been very helpful. Thank you all. Hi Robert, that sounds a good plan to go forward with, and having a second body will be very useful. From what rumours I read online, it looks as if the replacement for the 80D may have a little bit more resolution and perhaps image quality a tiny bit better than the 80D. I would expect that maybe it will have a little faster frame rate too, perhaps 8 fps depending on how much the image resolution goes up. I still would not expect it to best the 7D Mk2 in AF, speed, buffer and controls or in comfort if you have bigger hands. I would also think that the 7D Mark 2 can be had for some good deals at the moment or in the months ahead. Let us know how you come along? It might be pretentious for me to jump in after Grant already responded, but here goes in case it helps: when I was looking to upgrade, I spent a lot of time on Flickr and shutterdial.com to research photos taken with the bodies and lenses which I was waffling between, and it was a humbling as well as an eye opening experience. Hi – Robert makes an important point regarding his usage. He only displays his images on a “4K screen”, he is not making prints. A 4K screen is at most 4096×2160 pixels. If he chooses to resample his images to this lower resolution, he will be downsampling from 24MP to roughly 9MP. Firstly, I don’t think he will see any visible gain in image quality in going from APS-C (80D) to full frame (5D4) when the image is downsampled by this amount, unless the image is considerably cropped. Secondly, downsampling effectively reduces the visibility of noise, so higher ISOs will be less problematic. Together these factors favour staying with APS-C bodies, for his usage. If he wants a higher frame rate or better AF than the 80D provides, the 7Dmk2 would be ideal and is very affordable now. His 80D would then be his back up body. Also by staying with APS-C he will get more reach from his 100-400, and if he wants a wide angle he could buy the 10-18, which is a real bargain, a huge saving compared to a comparable super wide angle for full frame. It is a definite advantage having two bodies and not changing lenses in the open. Hi Nigel, you make a very valid point, and one that I did not make enough of for sure. Given that Robert is using the screen as his main display, you are right about there being potentially less image quality difference between full frame and APS C camera bodies. In my response to him I did ask whether image quality was something he was looking to gain strongly on or not? Thanks for your reply. Your analysis helped me out. I felt the urge to jump in with my upgrade path, having followed this page for a long time. I used to own a 450D with a 100-400, and after I got into bird photography I realised That the birds were small in the frame. As I couldn’t afford pricier glass, and as my camera was 8 yrs old, I got myself a 7D2. I used that for 2 years and during that interval, I realised I was getting keepers only when the light was really good. When I was shooting wildlife, it was under very low light conditions and due to my handheld technique if I went with high ISOs, I would end up with 10 FPS of mostly grainy shots. The 10 FPS was awesome for BIF in good light for sure. So I’m not knocking down APSC or the 7D2 in any way. Eventually I realised that I was taking most of my wildlife shots under low light so I switched to FF. Looking back, given my wildlife preferences, I think I took the longer and costlier path to FF, but that was only because I was unaware of (a) my own wildlife preferences and (b) was unaware of the difference that an FF sensor makes under low light. But then, if I had access to wildlife in sunny conditions I think I’d be really happy with the 7D2 and would’ve never thought of spending on the FF. Having gone FF, I feel the pinch with the loss of “reach” (the 7D2 has a higher pixel density than most FFs except 5DSR, and hence 7D2 has the effect of a better “reach”) but I’m hoping to offset that partially by (a) sticking to subjects that my gear can handle (b) improving my approach technique for birds (c) a 1.4 extender (d) change of shooting style from “close up” to “artistic habitat” when the subjects are not close enough. Also, the low light images of the FF are a delight even at ISO 6400, at least for me. In summary, I would certainly advise some analysis of personal preferences with respect to typical subjects and typical lighting conditions, those matter a lot more than the actual equipment. Do you any feedback on the recently launched Sigma 60 – 600 F4.5-6.3 DG OS HSM Sports Lens. I currently have the Sigma 150-600 mm f/5-6.3 DG OS HSM Contemporary Lens and used it on the Canon 7D Mark II for Wildlife photography. Have got some decent results when the lighting is appropriate and lower ISO’s. However I was keen to have your opinion or thoughts on whether the Sigma 60 – 600 F4.5-6.3 DG OS HSM Sports Lens would be a good upgrade as it supports a lower F Stop and a greater range i.e. 60 – 600 instead of 150 – 160. Hi Murali, unfortunately I have not had my hands on that lens nor even seen one in the wild as yet. 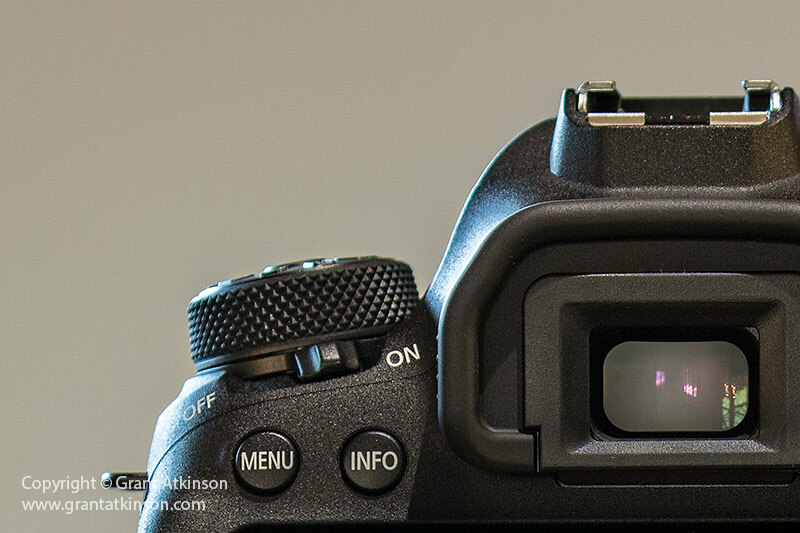 When you mention the lower f-stop, is that at the lower magnification numbers only? 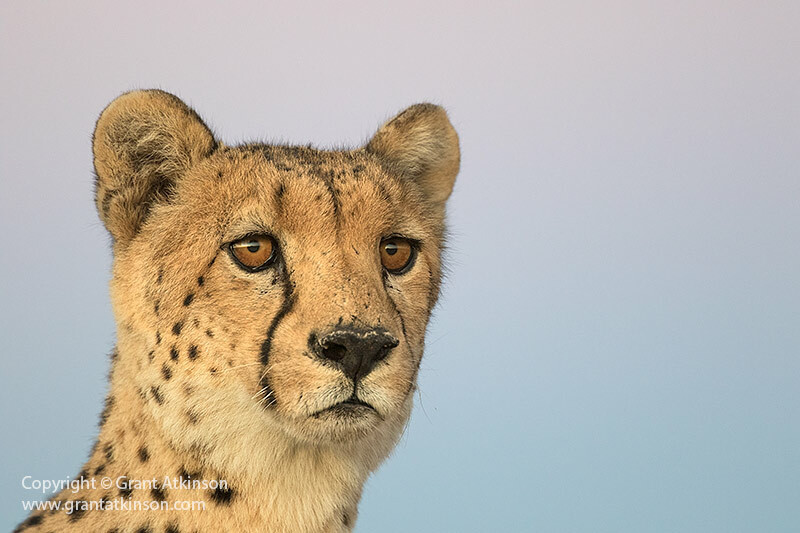 I will definitely keep a lookout for that lens and I am sure some of them will start showing up in my guests hands on my photosafaris and as soon as that happens I’ll be able to give some feedback. Thank you for the prompt response. I honestly am not aware if the lower F Stop is at the lower magnification number or available across all zoom ranges. The local dealer is expecting his first copy in about a fortnight from now. I perhaps will check on it. For now I have been following some of the lens reviews published online about this lens. Like the others in this thread I’d like to thank you for this review as it is really helping me make my decision to upgrade my 7dII to the 5dIV. However, before I commit to that I was wondering if by now you had any opinions yet on the EOS R? My main subject matter is wildlife (mostly birds and BIFs with any other animals I may encounter), but also enjoy shooting sports such as basketball, hockey, etc. I am only considering the EOS R because of rumblings about the “DSLR is dying” and the fact that the EOS R costs a few hundred dollars less here in Canada. I hear that the EOS R is “adequate” for faster subject matter such as BIFs and sports, but I would like to hear your thoughts. Hi Brian, thanks for writing. I have bought the EOS R and will be getting a post out on it sometime, so my response should be taken with the knowledge that I have about a month of shooting with it so far, and that I may be making some mistakes in my use and/or setup of the EOS R as I dont consider myself deeply experienced with it yet. I have used it with the adaptor on my EF 700-200, EF 100-400 and EF 500 f4 for a few thousand frames in the field so far, as well as with one RF lens, the RF 24-105 f4 L IS. So far I have managed to take action shots with it, but in my hands I find that the type of action scenarios where it can work well are limited. For example if I photograph a subject moving fast sideways across the frame, I am finding that after the 2nd or 3rd frame, I am unable to see my subject in real time in the viewfinder, and this leads to missed shots for me. If the subject moves around but in a relatively confined area so that the frame does not change radically from frame to frame, then I manage to get more shots in sequences. It may be my poor technique that is contributing to my low action keeper rate but I dont think it comes close to the 5Dmk4 for the action shooting that I do. I have not managed to use the EOS R with any of the very big aperture fixed lenses like the 50mm but that would be too short for wildlife anyway. I am finding the EOS R can do some things better than any other Canon camera but fast action shooting is not one of them at least in my hands. I am working at trying out more settings etc and will start posting more on the camera in January sometime. Feel free to ask here if you have more specific questions that I may be able to answer. So far the only full frame mirrorless camera i have seen that is truly action and sport capable is the Sony A9. Given that companies have already figured out most of the tech that goes into a DSLR, do you feel that the DSLR is on its way out? While I see the value of EVF in landscape and macro photography (for simulating the actual effect of settings) I cannot imagine anything beating a DSLR for autofocus speed + photographer response time because nothing can be faster than rays of light hitting the AF circuitry and OVF simultaneously in action shots. In a mirrorless setup the photographer is eventually slowed down by the time the EVF takes to simulate the scene. Hi Arun, with regard to your question, I think that there may come a time when a mirrorless camera can focus faster than current DSLR bodies, or even as fast as (and the Sony A9 is close to that now) but for the majority of mirrorless cameras that I have tried or owned (Canon M5, EOS R) and tried out (Olympus, Sony A7, Fuji) that time is not quite here yet. The viewfinder lag you write is a major part of what makes them less effective, for certain scenarios where moving subjects are involved. For keeping focus and keeping a clear view of sustained rapid movement of a subject the DSLR is far ahead. So for the kind of nature and wildlife photography that matters to me, the DSLR is by some margin the best tool for the job. I won’t be replacing any of my 1DX, 5Dmk4 or 7D mk2 bodies right now with existing mirrorless cameras right now and it would be disappointing if Canon don’t release newer versions of those DSLR cameras, at least until the mirrorless capabilities with motion, viewfinder lag and autofocus can reach similar performance. My feeling is that the stage is set for landscape, portrait and macro photographers to migrate to mirrorless FF systems. It is the action photographers who will continue to use DSLRs for a while. Which also means that all-in-one generic photographers like me who have to pick just one body for all genres will stick to DSLR as well. The concern is that as mirrorless sales increase, development of new dSLR models (and lenses) will be delayed or even stopped. That could leave sports and wildlife photographers with increasingly outdated camera bodies, as action photography is actually a minority interest within the market as a whole. 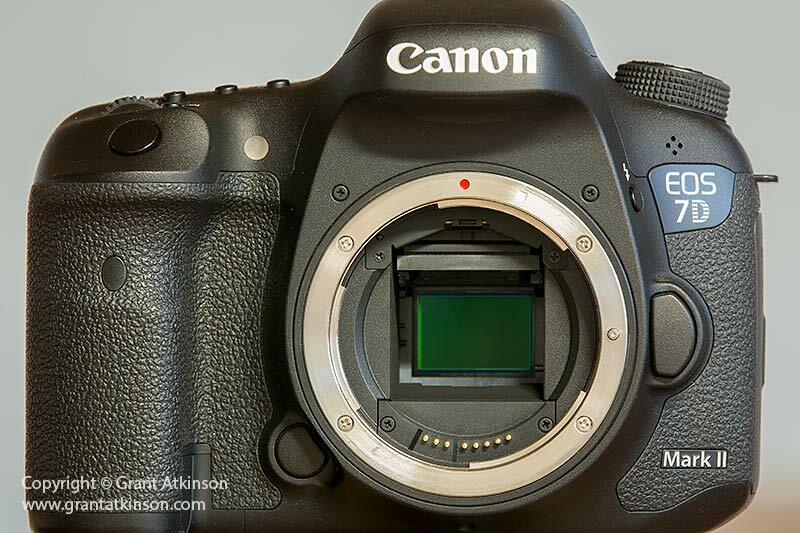 Already we have seen a long delay in the 7DmkIII, with no date yet predicted, and Canon shooters desperately need an updated APS-C body. I do think that overall with our digital cameras, whether with mirror or not, that advances in performance of both things like autofocus (actual AF accuracy and speed -not just number of points) as well as sensor image quality are coming more slowly than they where in previous years. So I think that may have contributed to the period between new models becoming longer. I think this is true for Nikon as well as their latest sensors in the Z7 and Z6 dont show big advances in noise, etc over older existing Nikon sensors like in the D750 and D850. I do think though that the action shooting segment of the market is important to Canon, otherwise they would not have just released two brand new super tele EF lenses (the EF 400L f2.8 IS iii and EF 600L f4 IS iii) right now. My expectation is that there will be a replacement for the 7D Mk 2 with a mirror but that perhaps sometime in the next four years, that the DPAF focus system will become fast enough to make it just as good or better than the current focus systems in the DSLR bodies. Until then action shooters probably shouldn’t worry to much that they are not using the right tool for the job. Who knows, it may even be that the current DPAF system in the EOS R would be able to keep its viewfinder refreshed and focus continuously at a fast enough rate if it had more processor power inside? Thank you for the incredibly detailed and thorough review of these cameras! I am an amateur wildlife photographer and have been using the Rebel T3 (entry-level and old, I know haha, but it has done great) and am looking to finally upgrade. Despite all the negative reviews, I have been leaning towards the canon 6d mk ii. I only have one EF-S lens and it needs to be retired so there is no problem with the FF glass switch. Canon has an incredible deal on their website right now and I can get the 6d mk ii for 1,200 USD with a free battery grip and 13 months protection. I do a lot of macro photography, particularly with reptiles as the subjects but definitely not limited to them. I’m an environmental biology major working on applying to graduate school and hoping to do wildlife photography on the side when I’m traveling/working. I have seen the 7d mk ii recommended for wildlife photography, but have seen less advertisement for the 6d mk ii in wildlife circles, your article being an exception. The primary concern I have is with all the talk of the “weaker DR of the 6d mk ii.” Do you have some insight into this? What particular areas of wildlife photography would be significantly impacted (if any) by the poorer DR? Do you think it should be a deal breaker? I’m glad the above question got asked 🙂 I have been eyeing the 6D2 for macro and landscapes because among canon cameras with an articulating LCD that seems to have the best sensor and I assumed that an articulating LCD would be very useful for both those genres. Hi Paul, sorry for my late response, and yes, I do believe that the 6D2 is a good camera for landscapes and macro, for its ease of use with the flip out screen, excellent DPAF autofocus and decent resolution. 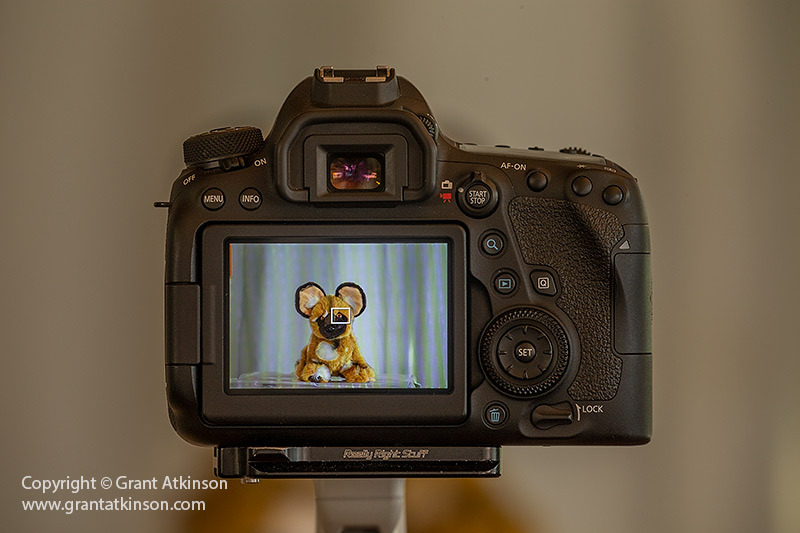 If you are working with flash your main light source for macro then you may find that the 80D Canon could be better for macro due to its smaller pixel size, but that would only be a consideration if you where struggling to get enough magnification with the 6D Mk 2. I only mention this because I noticed that the image quality of the Canon APS-C sensor benefits greatly from flash. In regular ambient light the 6D Mk 2 has better image quality than the Canon APS-C sensors in my experience. Thanks so much Grant! I ended up going with the 6Dmk2. It was a little more affordable than the 7Dmk2 at the time and the low light performance is important to me as I will likely use it a good deal in dense forest settings. I’m fairly certain the somewhat weaker dynamic range will be negligible for me. I know they are both great cameras (even if the 6Dmk2 didn’t have all the features people were looking for in a 2017 model, but I don’t really need 4k video either). I appreciate your quick response! Hi Joseph, i hope it does the job for you. It has a lot of features packed into its compact body, and it is one of Canon’s better performers in low light, so I would expect it to do well in forest! Loved reading the detailed review of the cameras above. When reading the Q&A all my questions where answered. 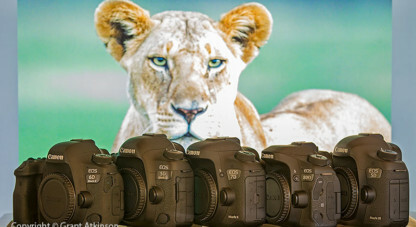 Heading for a Safari in S. Luanga and going to add a 5D IV to my 7D2 after reading the article. Should I bring a TC1,4 or a TC2 when combining the 5D IV with the 100-400 II ? Glad the feedback was useful. Personally my preference is for the faster AF response and higher accuracy that comes with the 1.4x Extender, so I would choose to not use the 2x extender. It can do a job of getting you to 800mm of focal length but the amount of ambient light needed is very high with the weak maximum aperture. 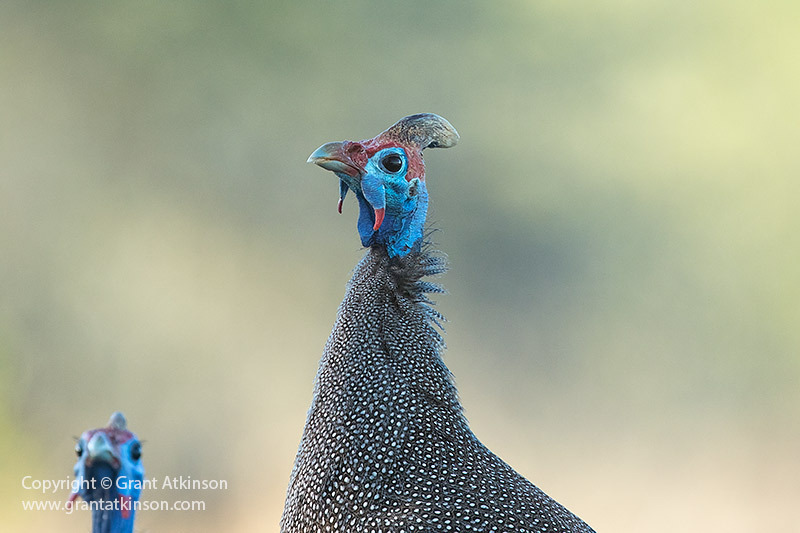 The 1.4 stlll gives a very usable 560mm of focal length and usually the wildlife in South Luangwa is quite approachable. 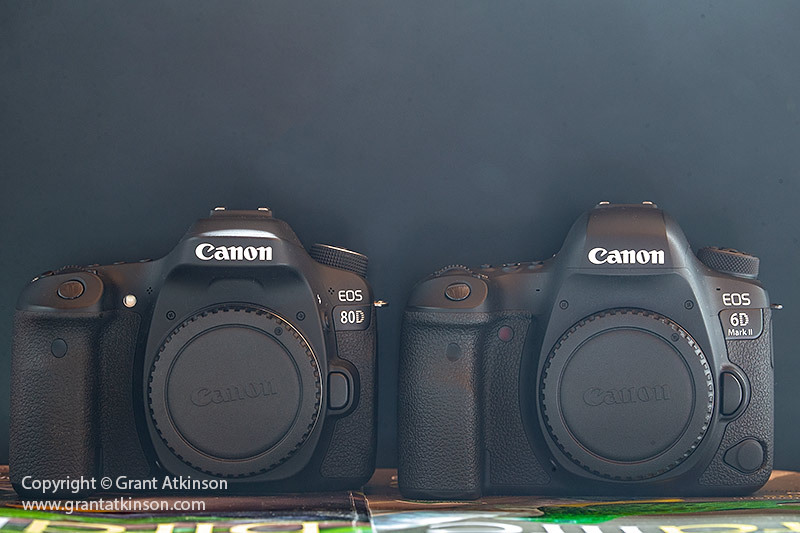 I have 2 Canon bodies – 7D Mk II and 60D. For lens I have 100-400, 18-135 and a 24-70. I am planning to go to Tanzania in July. I want to use the 7D + 100-400 and a second body with the 24-70. The 7D combo seems to perform well under good light but hasn’t been so great in low light. I am also not very happy with my 60D paired with any lens (I am an amateur). I am thinking I will get a FF for low light. 3. 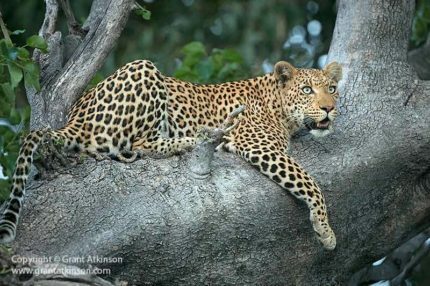 What should my ideal pairing be for Tanzania (I want to avoid changing lenses) – 7D + 100-400 and FF + 24-70 Or, 7D + 24-70 and FF + 100-400. Thanks for writing. Whether you get the 6Dmk ii or the 5D mk 4, your 100-400 IS f4.5-5.6 will perform at least twice as well in image quality when the light is low, compared to a 7D or 60D. On those two cameras I used to try to always keep my ISO setting below 800 whenever I could, whereas with the 6D Mark 2 I am happy to shoot at iso 3200 quite easily, and even more than that with the 5D Mk 4 with the images remaining good enough for print or web use. The image sensors on the 5Dmk4 and the 6D Mark ii have a much larger surface to them than the sensor in the 7D and 60D, so they will gather more light, just like any other chain in the optical component system. With regard to the ideal combination, that will depend on two things, really. If you are capturing the majority of your favourite images on the 100-400 lens then I would be using that with the full frame body. If you are capturing images early in the day, right around sunrise when many African predators are most active, then the full frame body on the 100-400 will be the best option. 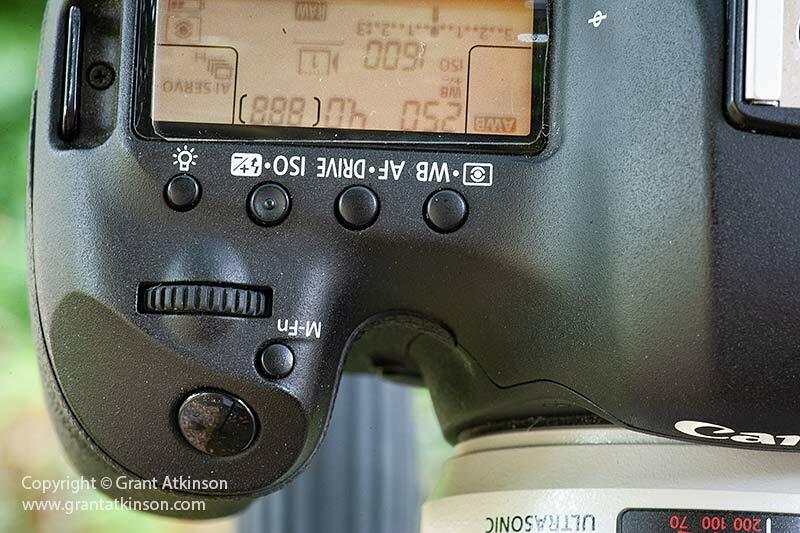 The only time there may be an advantage to the smaller pixel pitch of the 7D or 60D would be once the sun is higher in the sky, and if you had to crop away more than half of the full frame image. I would still contend though that the 5D Mk4 with its superior image quality, and quite a fine resolution sensor will mostly outperform the two crop sensor cameras even if you cropped it down to 10 megapixels resolution. Great article.Thanks so much Atkinson…. Thank you for the extremely informative article. I am an enthusiast photographer who likes capturing landscapes and wildlife. When taking photographs I want to highlight the play of vivid colors, the contrast of textures and play of light. Currently, I am using Canon 60D and want to upgrade to either 6D Mark 2 or 7D Mark 2. Would appreciate your input which of these would be a good choice for both styles of photography. My heart says 7D mark 2, but mind says 6D Mark 2. Glad the post was useful. The single biggest difference between those two cameras is image quality, with the 6D Mark 2 having a strong advantage due to its full frame sensor, as well as being able to make bigger prints, and showing much stronger image quality if you shoot in very low ambient light situations. The 7D Mark 2 has an autofocus advantage, and a control advantage, together with speed and response. Only you can decide whether landscape (6D Mark 2) is more important along with low light photography or fast moving action wildlife (7D Mark 2) is the more important of the two kinds of photography. If its landscapes then choose the 6D Mark 2. If its wildlife and mostly in quite bright light then it may be the 7D Mark 2. As you own the 60D, you can already use it as a bit of a reference – with regard to image quality the 7D Mark 2 offers a real but not massive improvement in image quality with regard to shooting at iso settings above iso 400 up to iso 3200. The 6D Mark 2 is of a similar size and similar controls to the 60D but is several stops better in image quality specially when light is low. Just want to say your video tutorials have been so incredibly helpful to me as a newbie photographer. I refer back to them often when I am frustrated with my results, but that’s not to say I haven’t gotten some pretty awesome shots for someone just starting out! Thanks for sharing your time and expertise-much appreciated! Thank you for your reviews and your articles and videos, they are well done and a joy to watch. I hope you continue to make more of this high quality content.